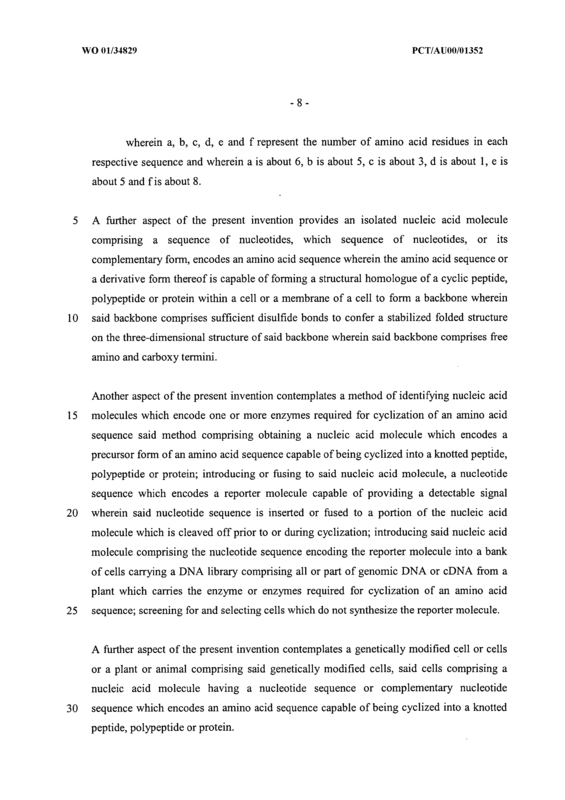 An isolated nucleic acid molecule comprising a sequence of nucleotides, which sequence of nucleotides, or its complementary form, encodes an amino acid sequence wherein the amino acid sequence or a derivative form thereof is capable of being cyclized within a cell or a membrane of a cell to form a cyclic backbone wherein said cyclic backbone comprises sufficient disulfide bonds to confer a stabilized folded structure on the three-dimensional structure of said backbone. 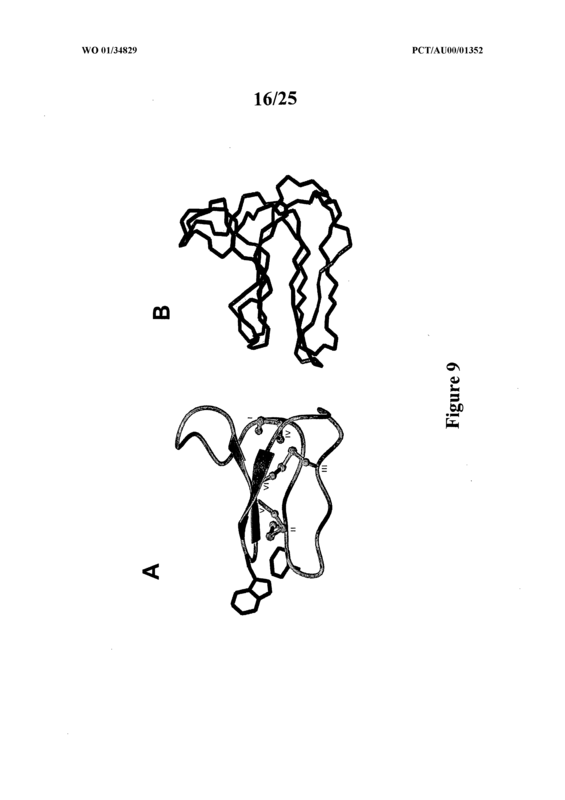 An isolated nucleic acid molecule according to Claim 1 wherein the stabilized folded structure comprises a knotted topology. 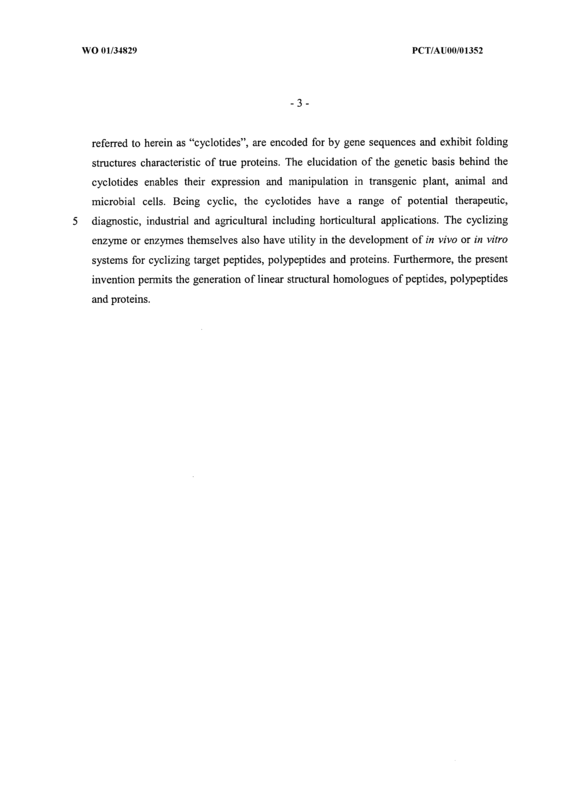 An isolated nucleic acid molecule according to Claim 1 or 2 wherein the amino acid sequence is cyclisable in an in vitro system comprising cyclizing enzymes or chemical means for cyclization. 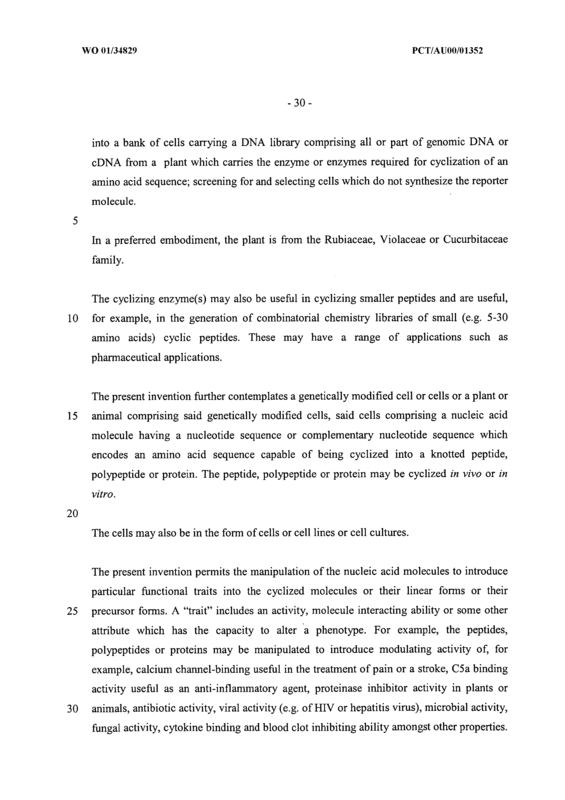 An isolated nucleic acid molecule according to Claim 1 or 2 or 3 wherein the nucleic acid molecule is DNA. 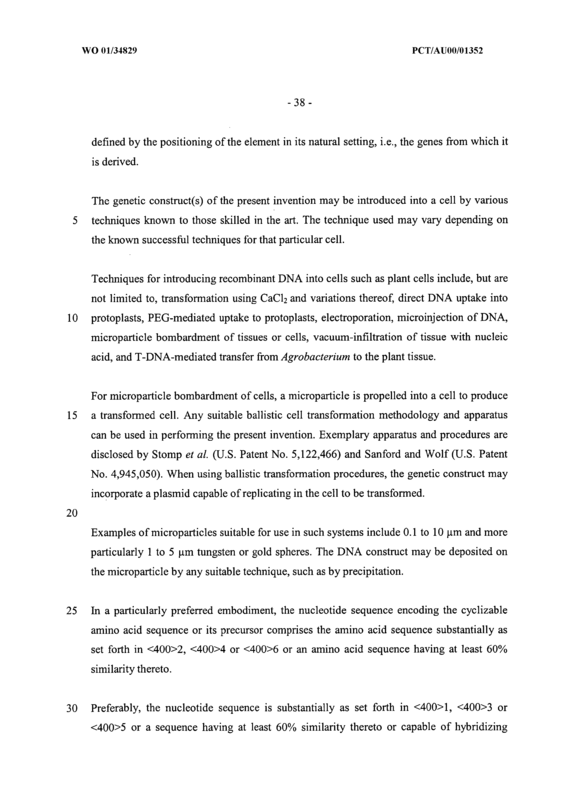 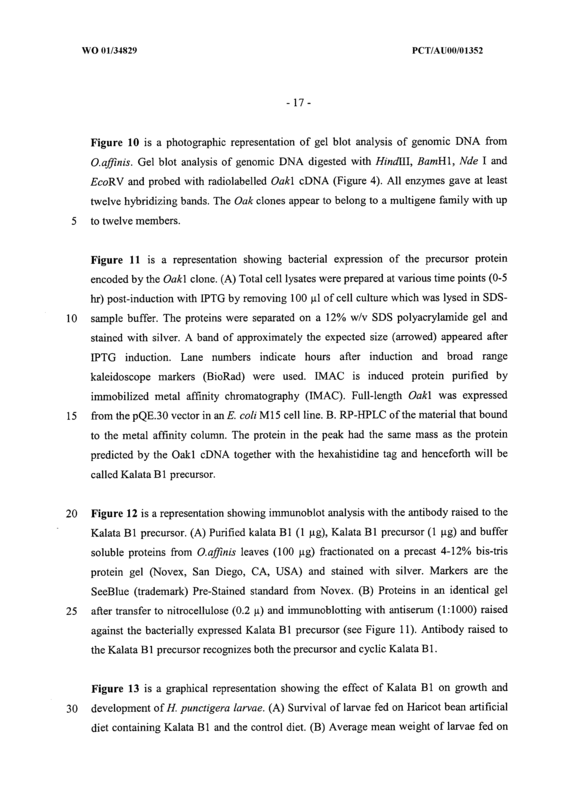 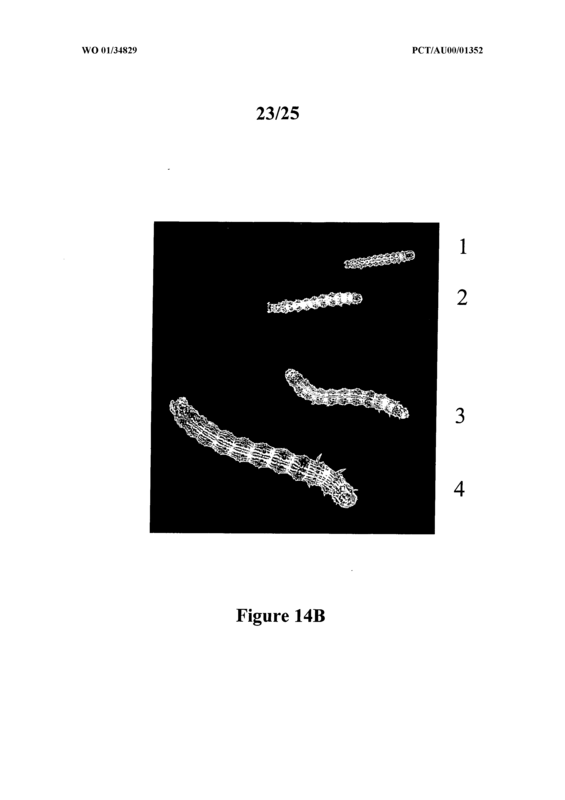 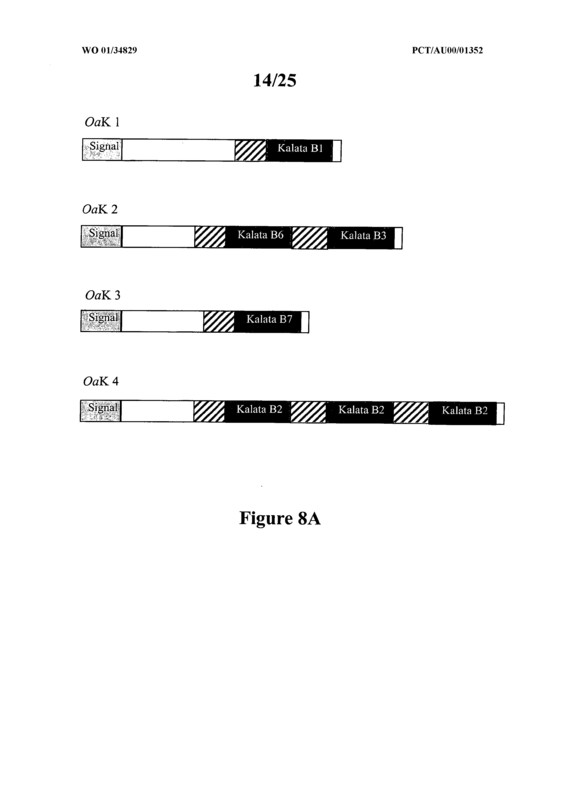 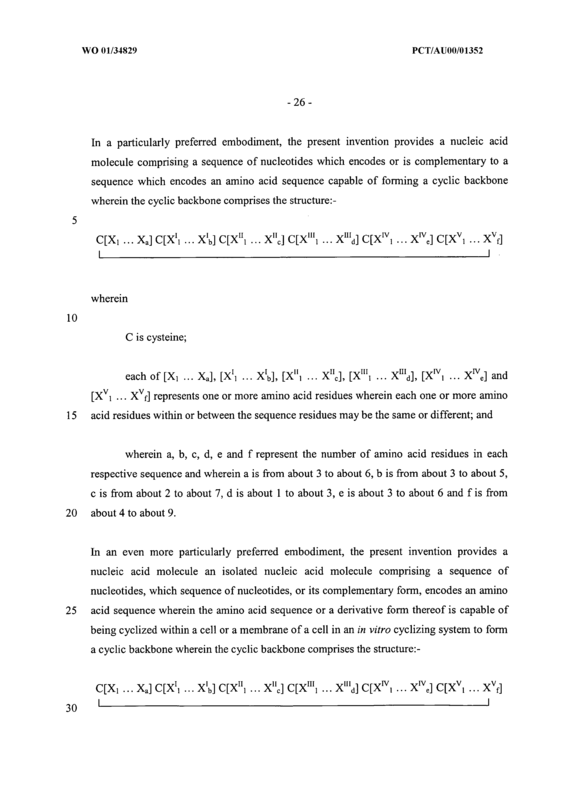 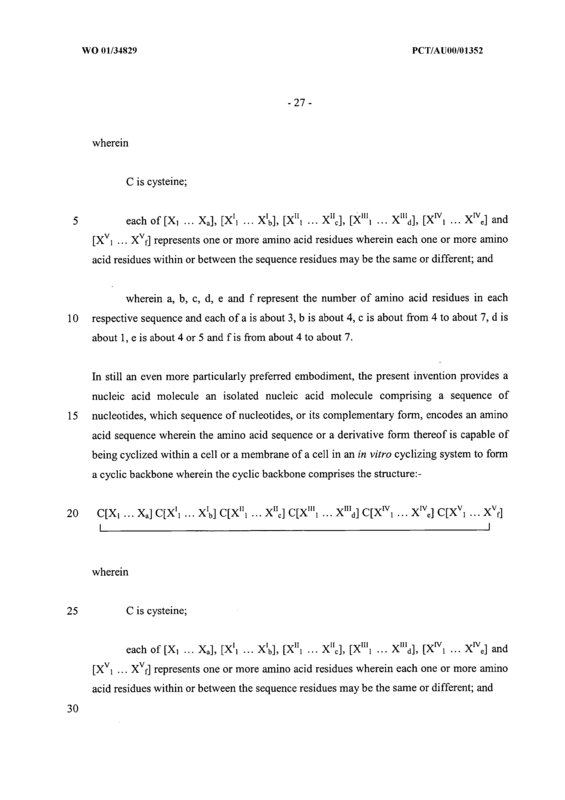 An isolated nucleic acid molecule according to any one of Claims 1 to 4 wherein the cyclic backbone comprises the structure: C[Xi ... Xa] C[X11 ... X'b] C[X"i ... X"c] C[X"'i ... X"'d] C[Xw1 ... Xwe] C[Xvi ... XVf] wherein C is cysteine; each of [Xi ... Xa], [X 1I ... X'b], [XIli ... X"c], [X'i ... X"'d], [XIvi ... X'e] and [Xvi ... Xvf] represents one or more amino acid residues wherein each one or more amino WO 01/34829 PCT/AUOO/01352 -58 acid residues within or between the sequence residues may be the same or different; and wherein a, b, c, d, e and f represent the number of amino acid residues in each respective sequence and each of a to f may be the same or different and range from 1 to about 20. 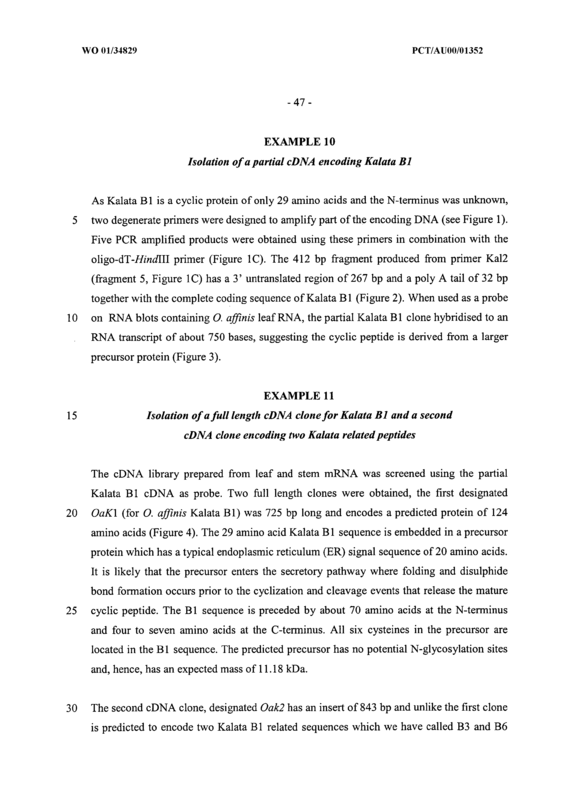 An isolated nucleic acid molecule according to Claim 5 wherein the each of a to f ranges from about 1 to about 10. 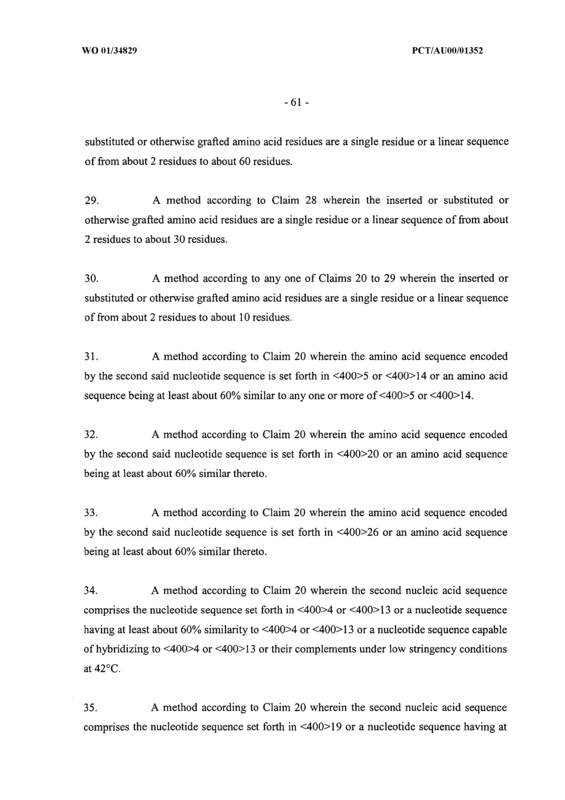 An isolated nucleic acid molecule according to Claim 5 or 6 wherein a, b, c, d, e and f represent the number of amino acid residues in each respective sequence and whrein a is from about 3 to about 6, b is from about 3 to about 5, c is from about 2 to about 7, d is about 1 to about 3, e is about 3 to about 6 and f is from about 4 to about 9. 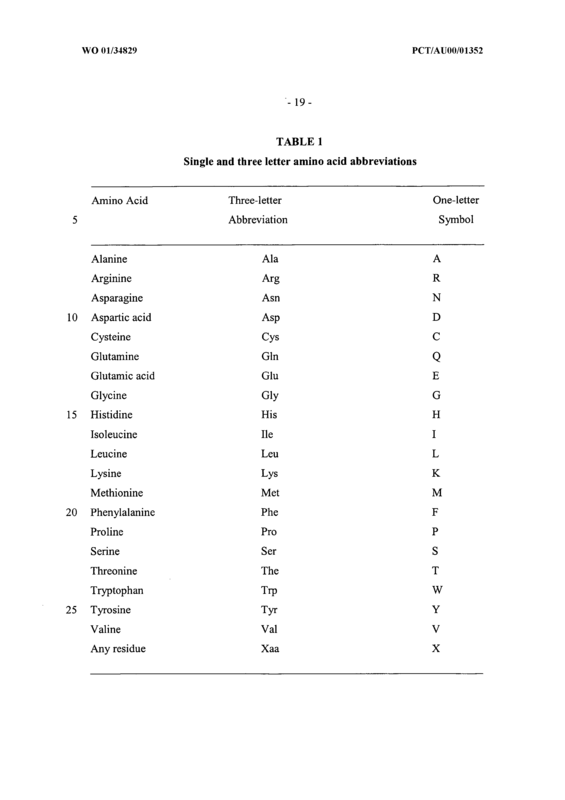 An isolated nucleic acid molecule according to Claim 5 or 6 wherein a, b, c, d, e and f represent the number of amino acid residues in each respective sequence and wherein a is about 3 , b is about 4, c is from about 4 to about 7, d is about 1, e is about 4 or 5 and f is from about 4 to about 7. 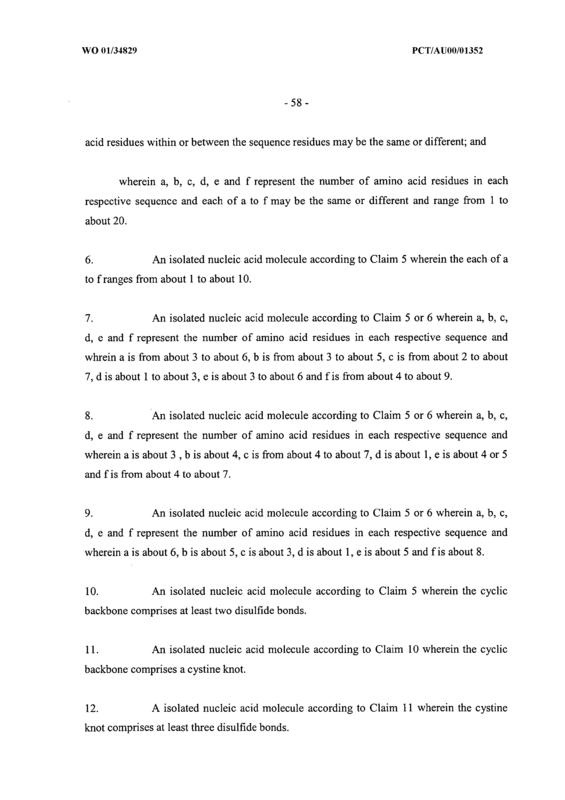 An isolated nucleic acid molecule according to Claim 5 or 6 wherein a, b, c, d, e and f represent the number of amino acid residues in each respective sequence and wherein a is about 6, b is about 5, c is about 3, d is about 1, e is about 5 and f is about 8. 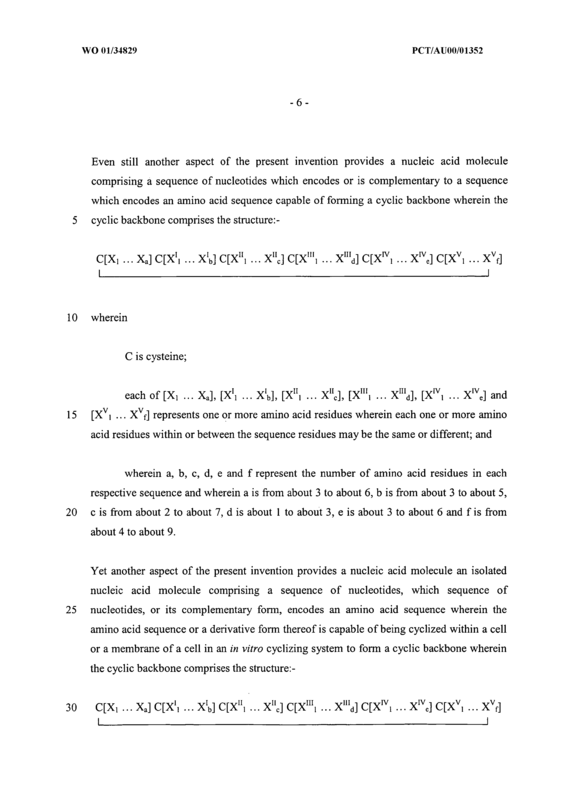 An isolated nucleic acid molecule according to Claim 5 wherein the cyclic backbone comprises at least two disulfide bonds. 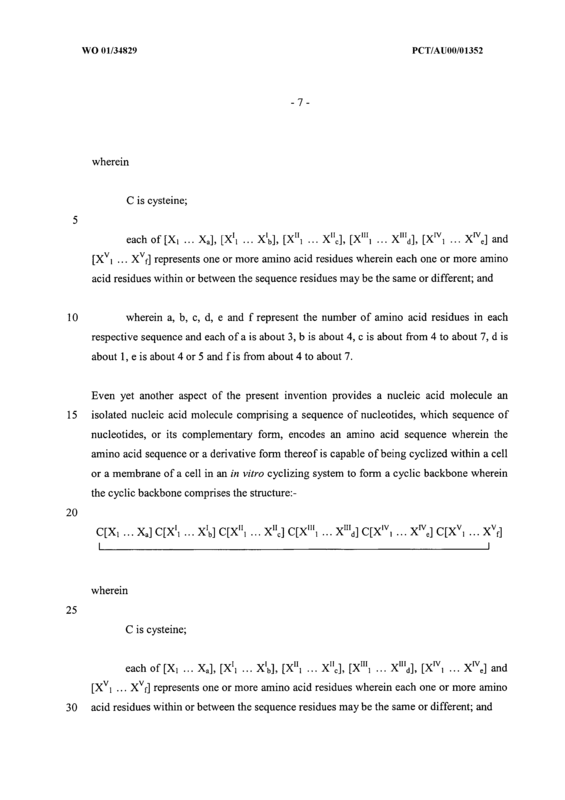 An isolated nucleic acid molecule according to Claim 10 wherein the cyclic backbone comprises a cystine knot. 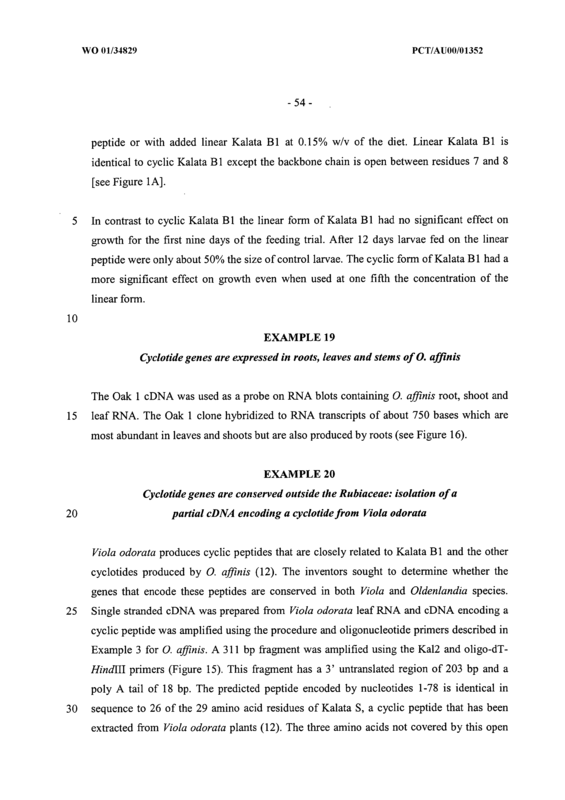 An isolated nucleic acid molecule according to Claim 11 wherein the cystine knot comprises more than three disulfide bonds. 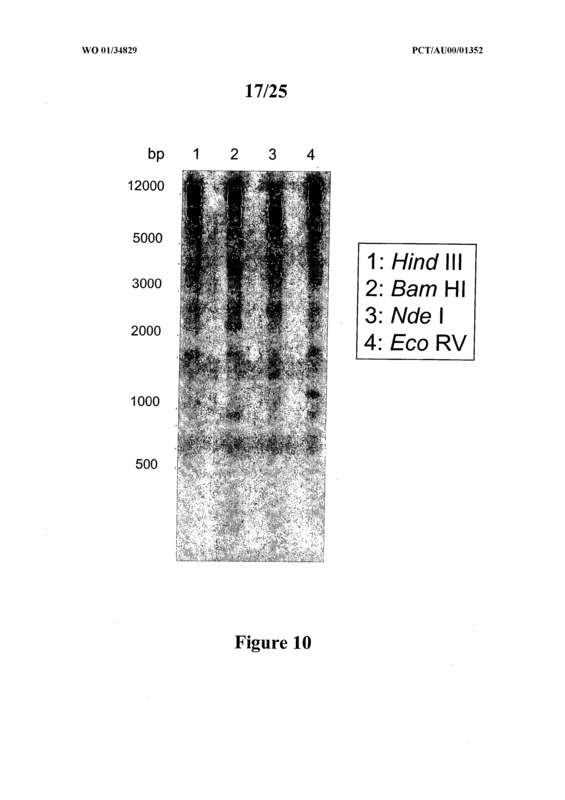 An isolated nucleic acid molecule according to Claim 5 wherein the nucleic acid molecule encodes the amino acid sequence set forth in <400>5 or 14 or an amino acid sequence being at least about 60% similar thereto. 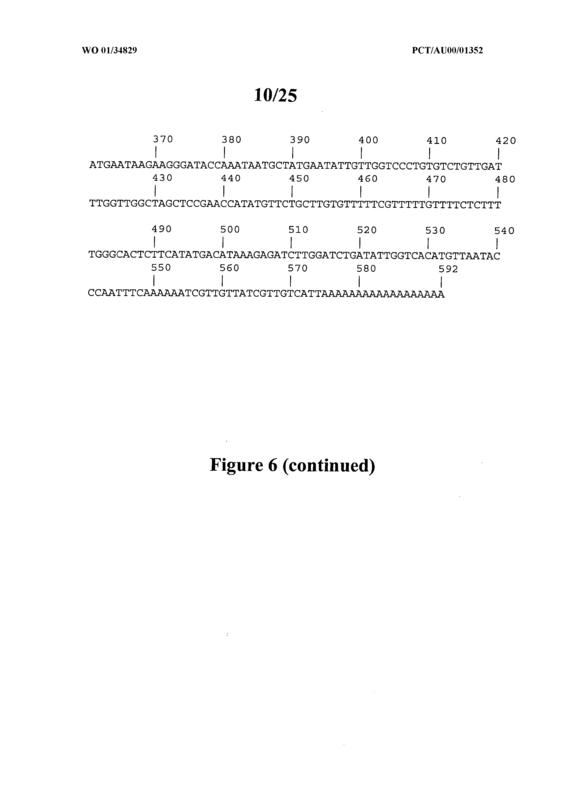 An isolated nucleic acid molecule according to Claim 5 wherein the nucleic acid molecule encodes the amino acid sequence set forth in <400>20 or an amino acid sequence being at least about 60% similar thereto. 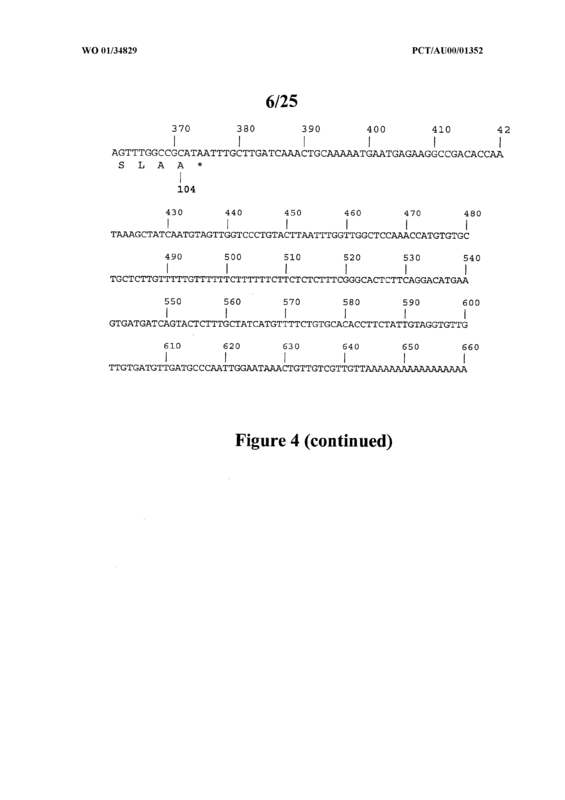 An isolated nucleic acid molecule according to Claim 5 wherein the nucleic acid molecule encodes the amino acid sequence set forth in <400>26 or an amino acid sequence being at least about 60% similar thereto. 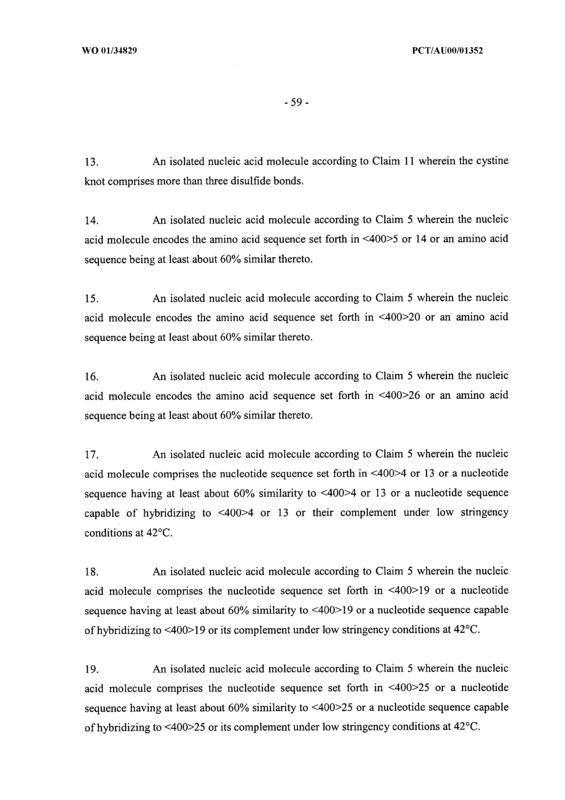 An isolated nucleic acid molecule according to Claim 5 wherein the nucleic acid molecule comprises the nucleotide sequence set forth in <400>4 or 13 or a nucleotide sequence having at least about 60% similarity to <400>4 or 13 or a nucleotide sequence capable of hybridizing to <400>4 or 13 or their complement under low stringency conditions at 42'C. 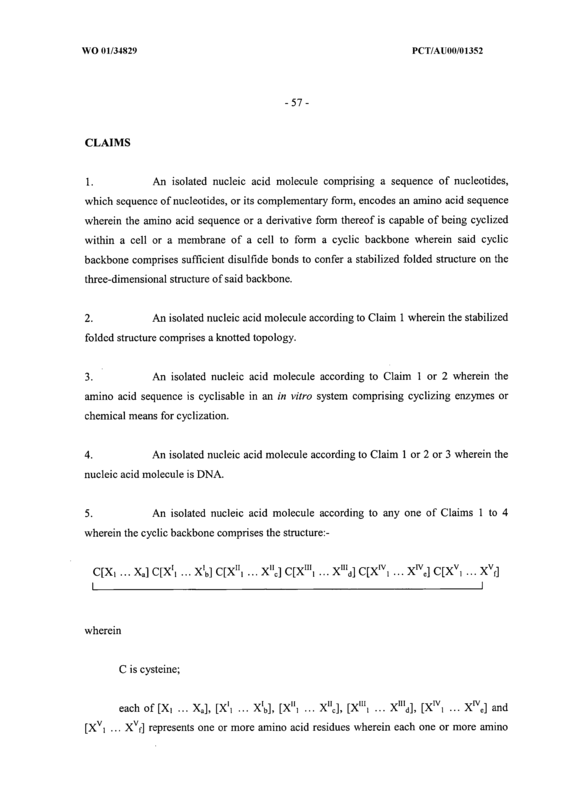 An isolated nucleic acid molecule according to Claim 5 wherein the nucleic acid molecule comprises the nucleotide sequence set forth in <400>19 or a nucleotide sequence having at least about 60% similarity to <400>19 or a nucleotide sequence capable of hybridizing to <400>19 or its complement under low stringency conditions at 42'C. 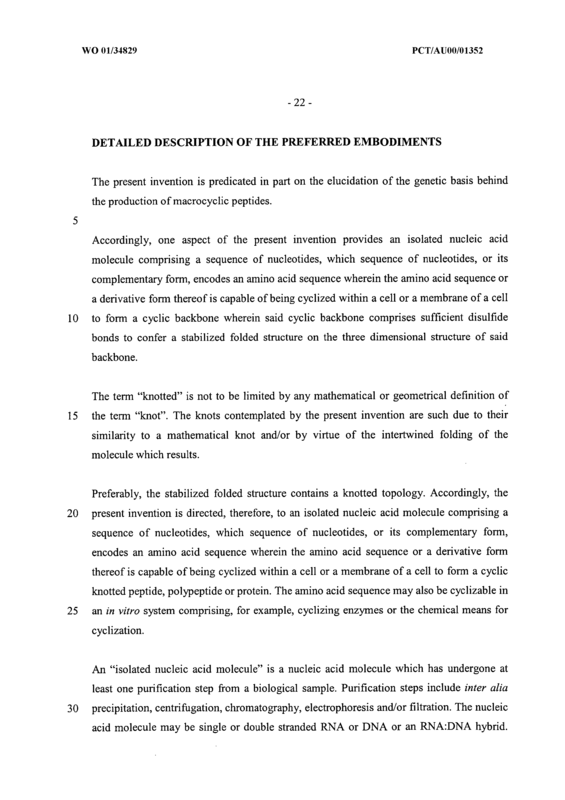 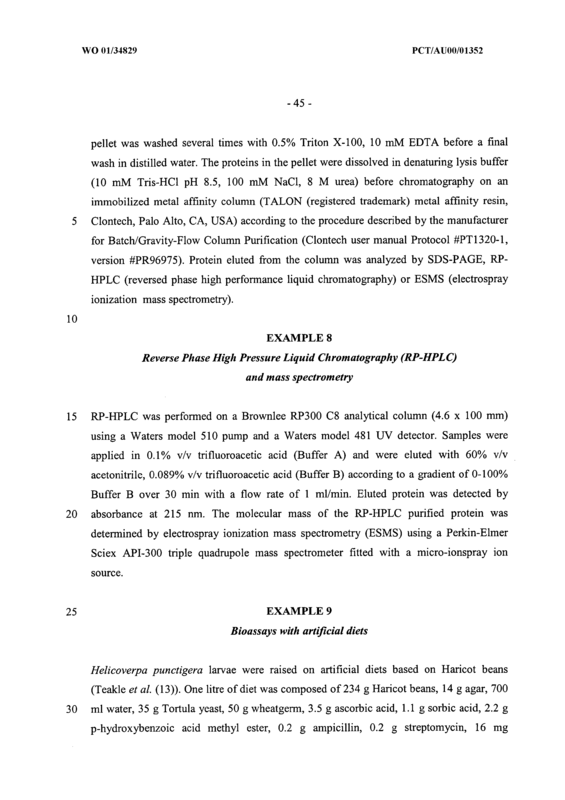 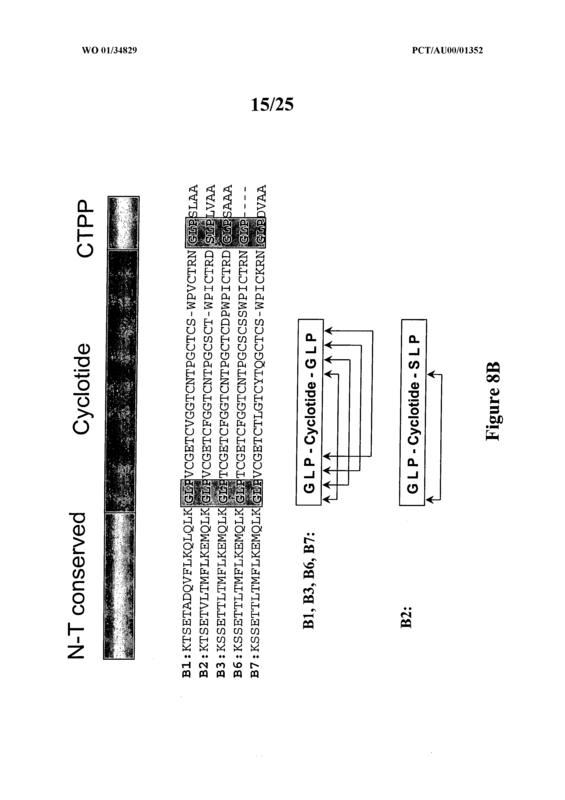 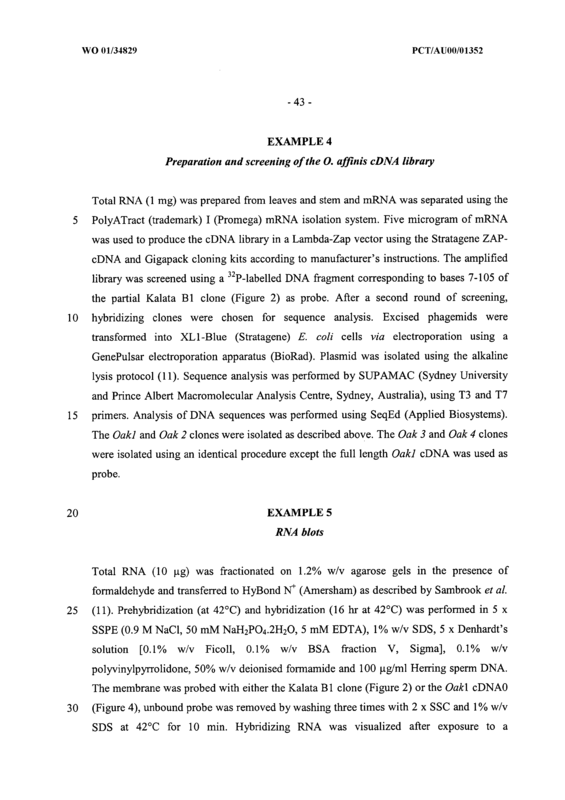 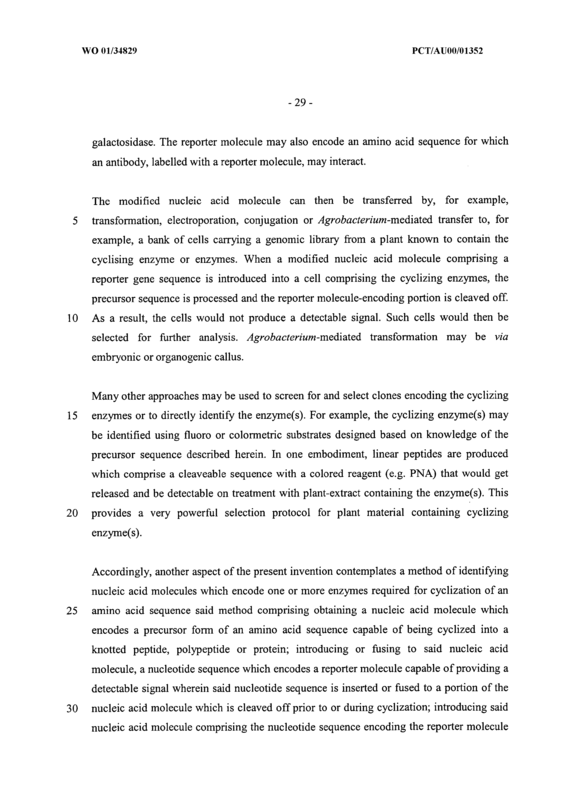 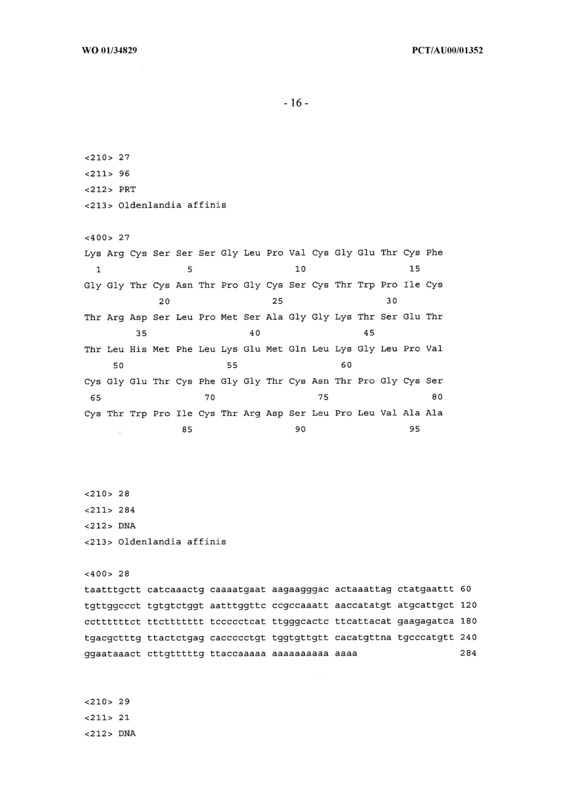 A method of incorporating an amino acid sequence conferring a particular trait into a cyclic peptide, polypeptide or protein, said method comprising fusing or introducing a nucleotide sequence encoding said amino acid sequence to or into a second nucleotide sequence wherein said second nucleotide sequence encodes a peptide, polypeptide or protein which peptide, polypeptide or protein or a derivative thereof is capable of being cyclized into a knotted peptide, polypeptide or protein. 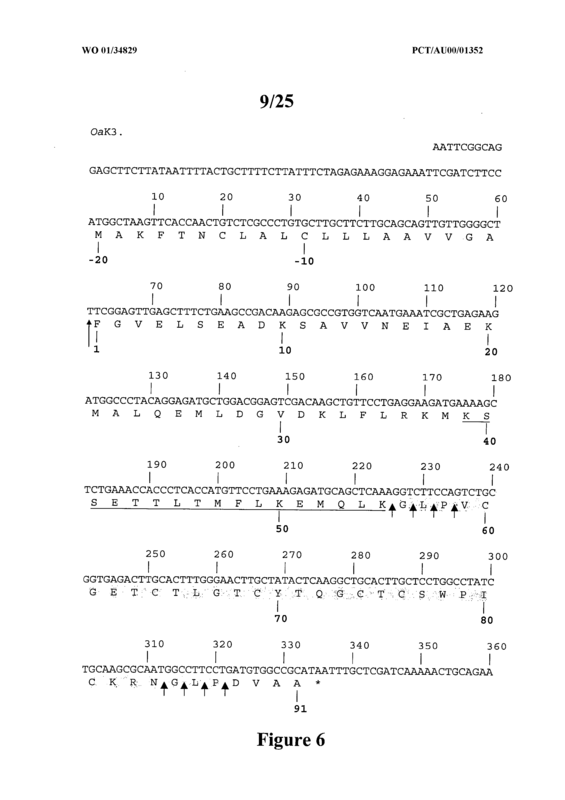 A method according to Claim 20 wherein the introduced amino acid sequence is inserted into at least one exposed amino acid residue on a beta turn and/or other part of the backbone. 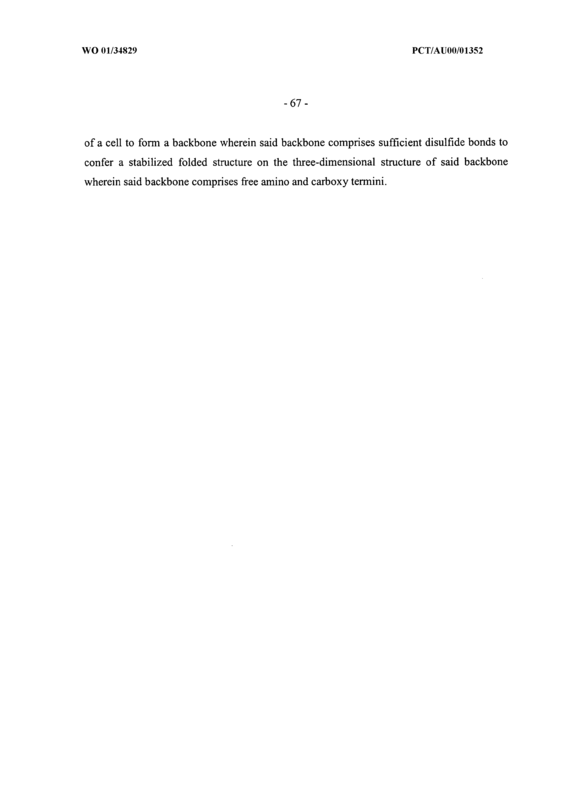 A method according to Claim 20 wherein the other part of the backbone is one or more loops. 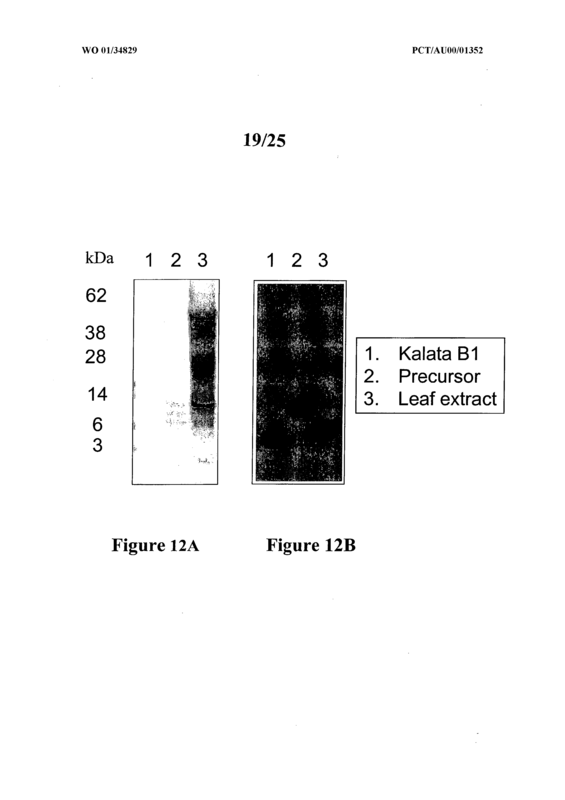 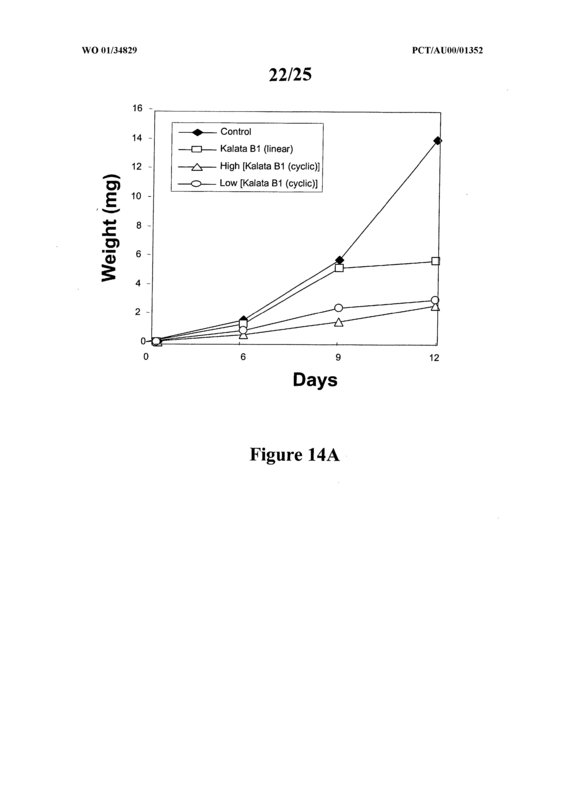 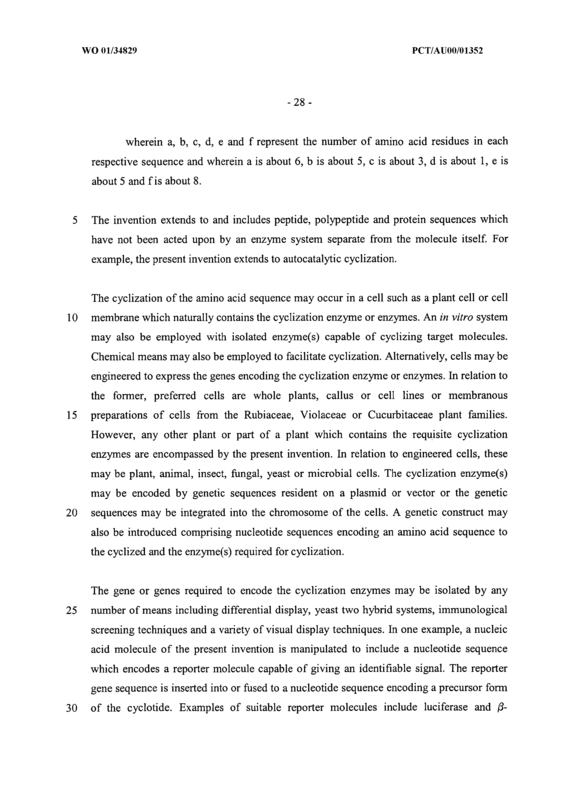 A method according to Claim 21 or 22 wherein two or more amino acid sequences are inserted, substituted or otherwise grafted onto the backbone. 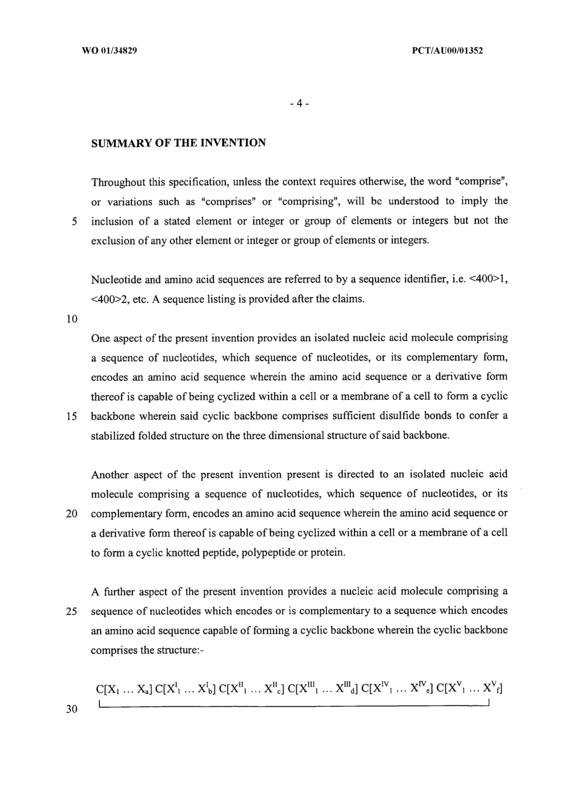 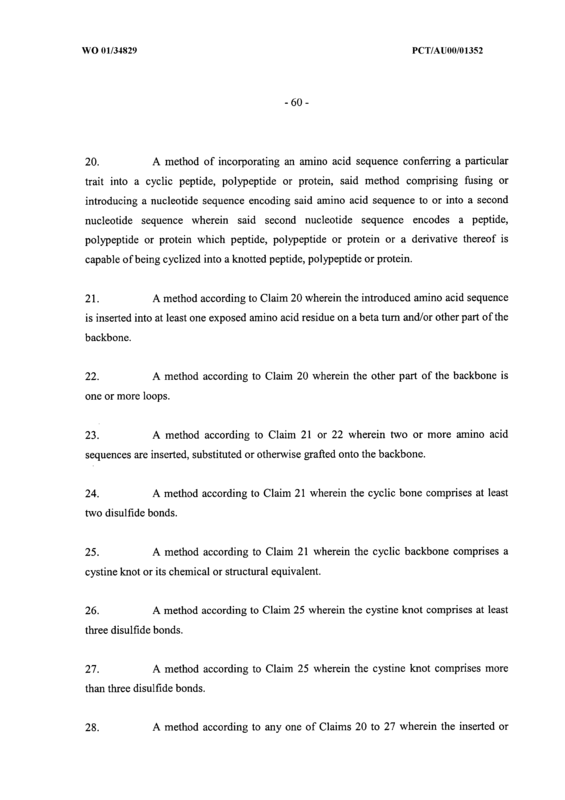 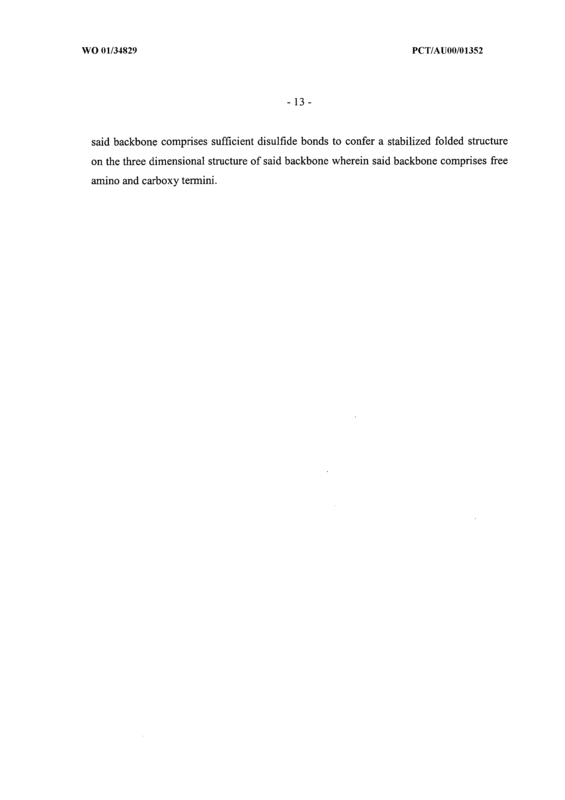 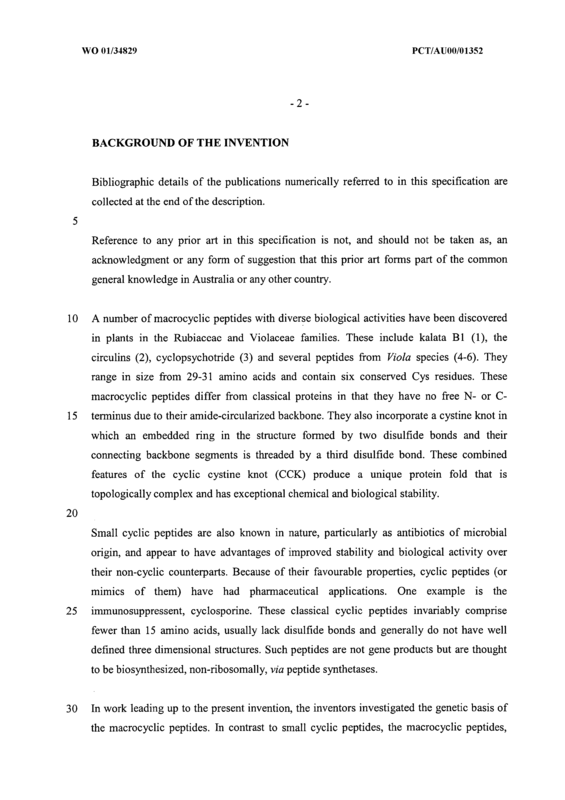 A method according to Claim 21 wherein the cyclic bone comprises at least two disulfide bonds. 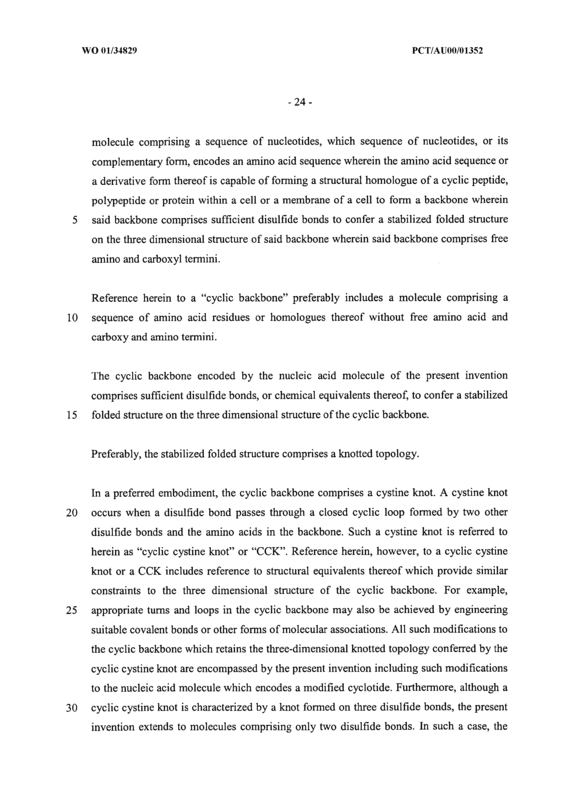 A method according to Claim 21 wherein the cyclic backbone comprises a cystine knot or its chemical or structural equivalent. 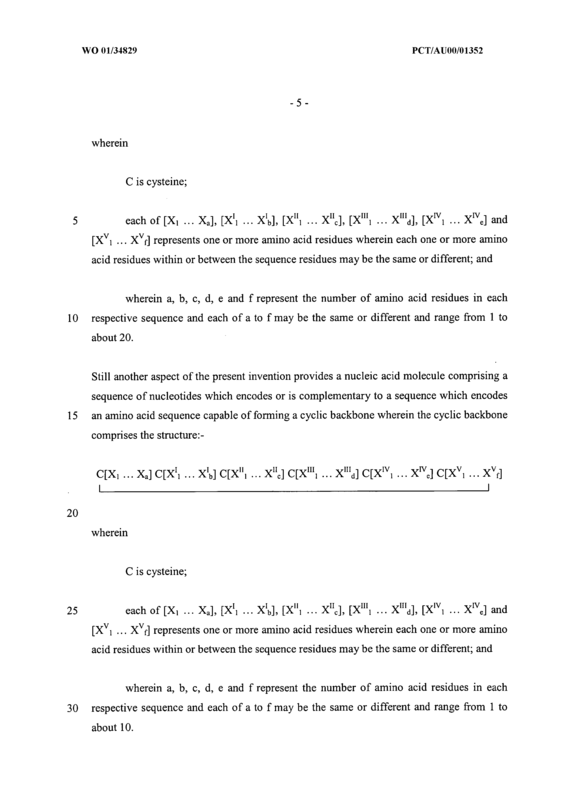 A method according to Claim 25 wherein the cystine knot comprises at least three disulfide bonds. 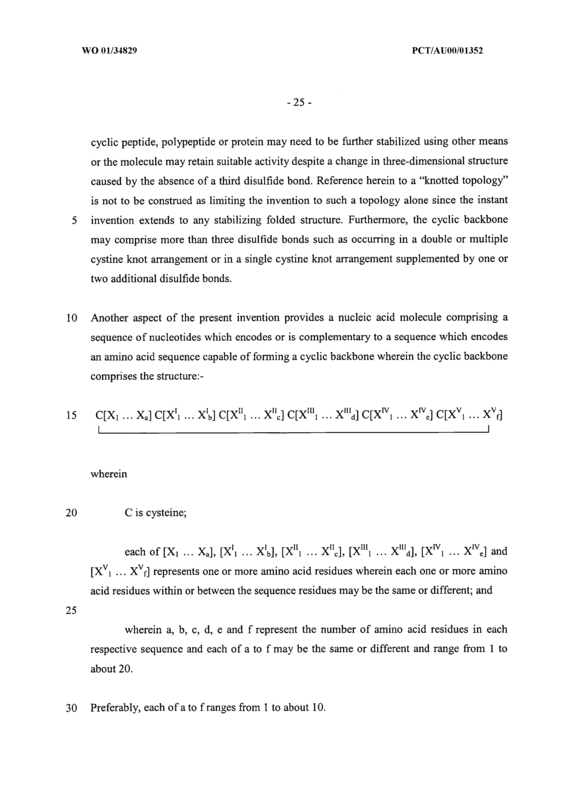 A method according to Claim 25 wherein the cystine knot comprises more than three disulfide bonds. 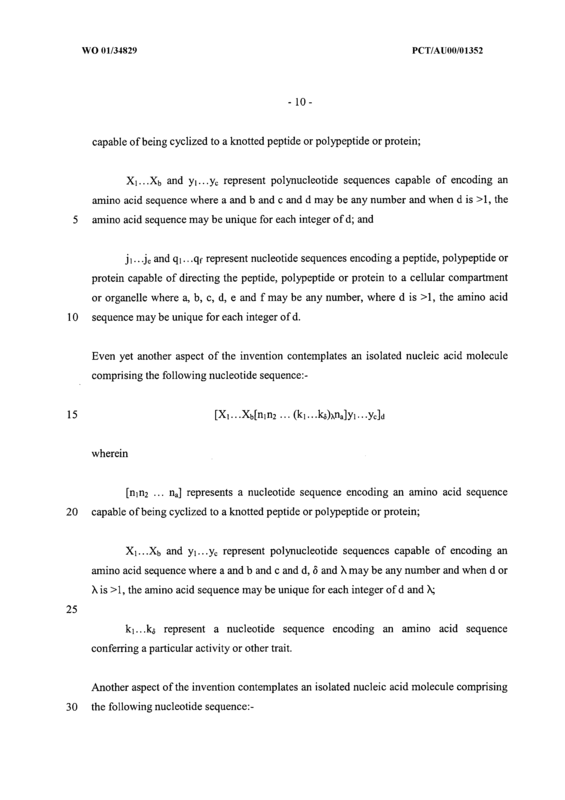 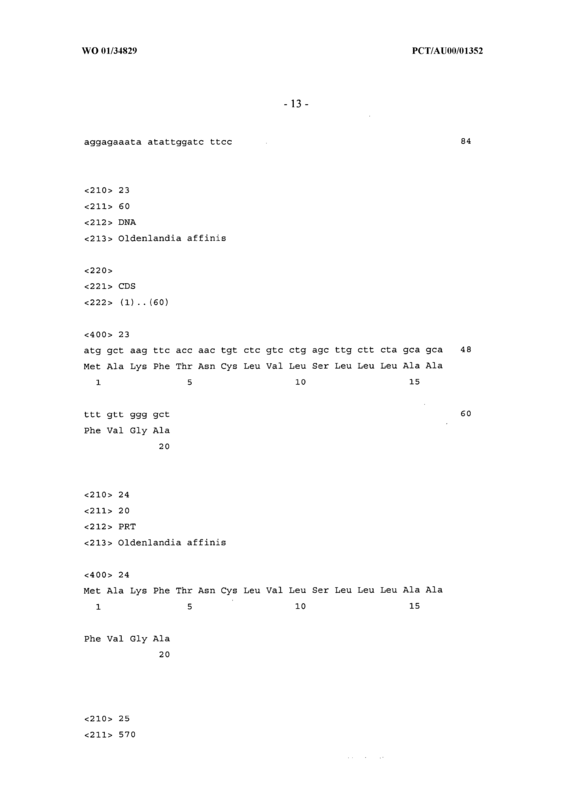 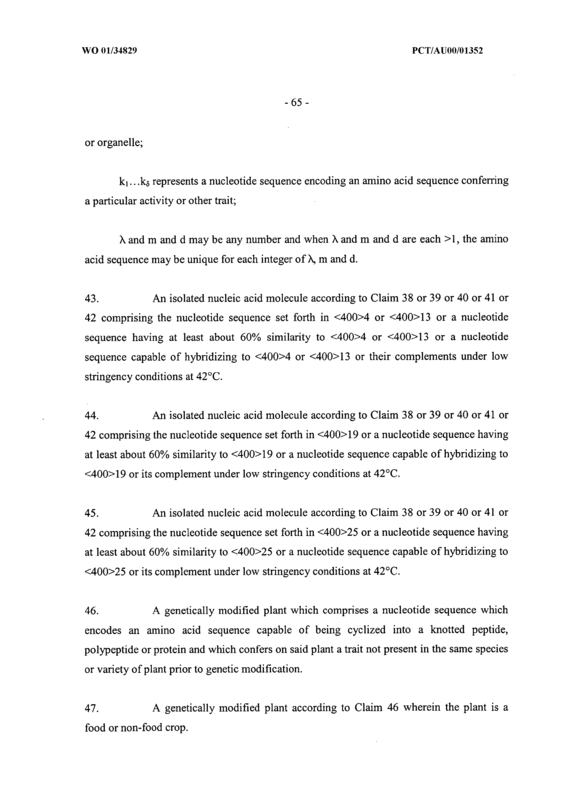 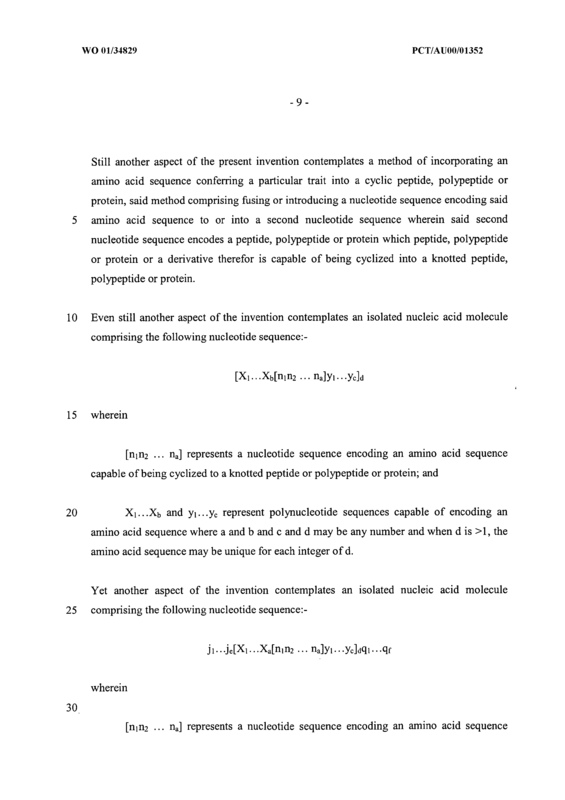 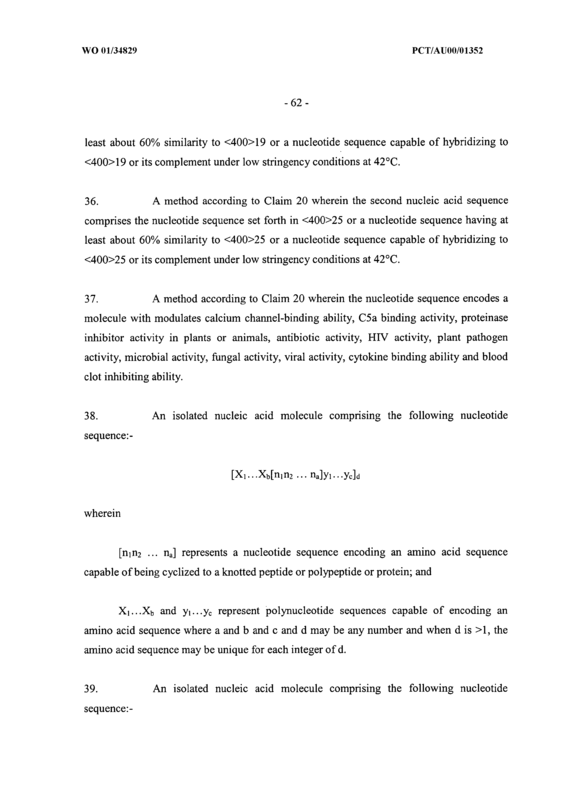 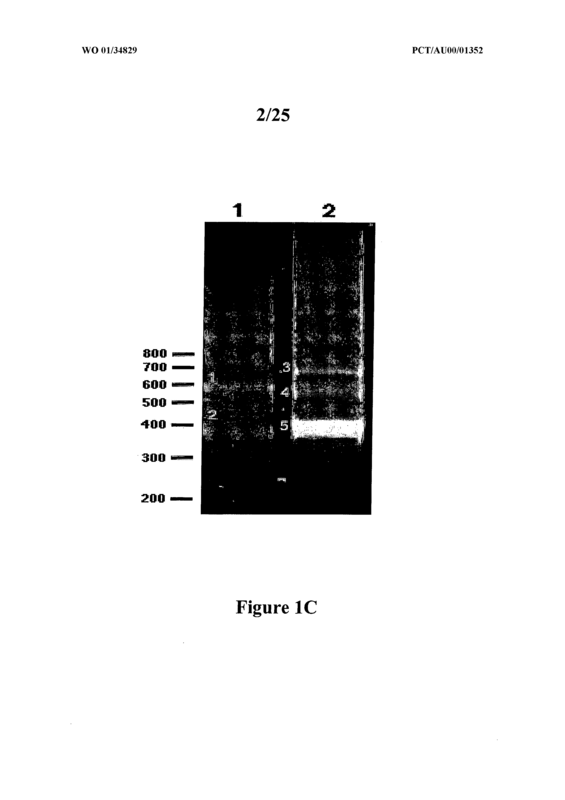 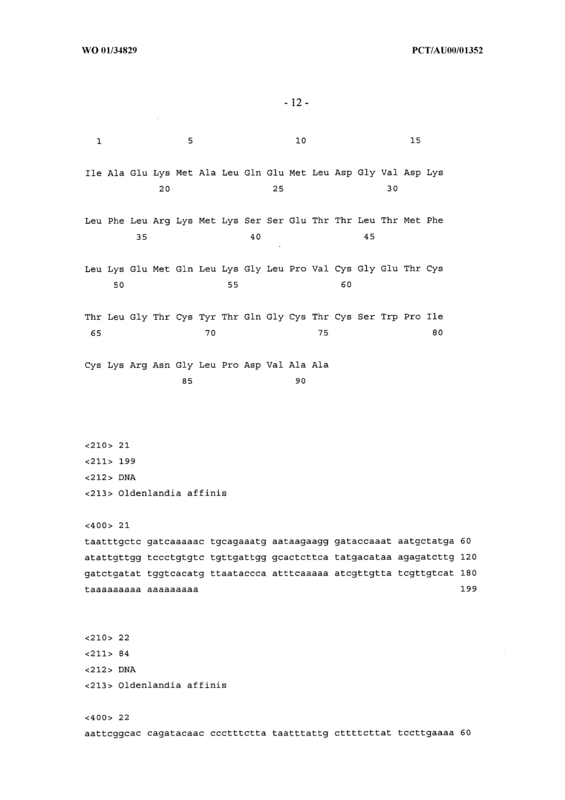 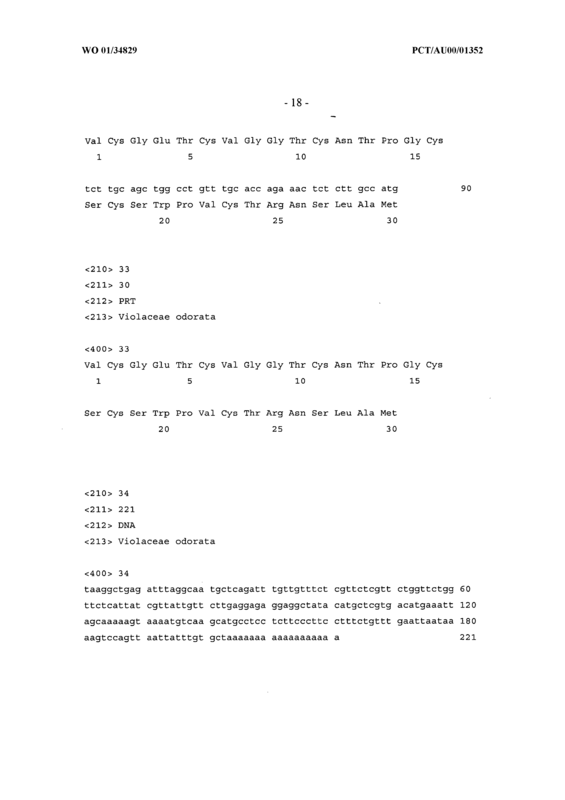 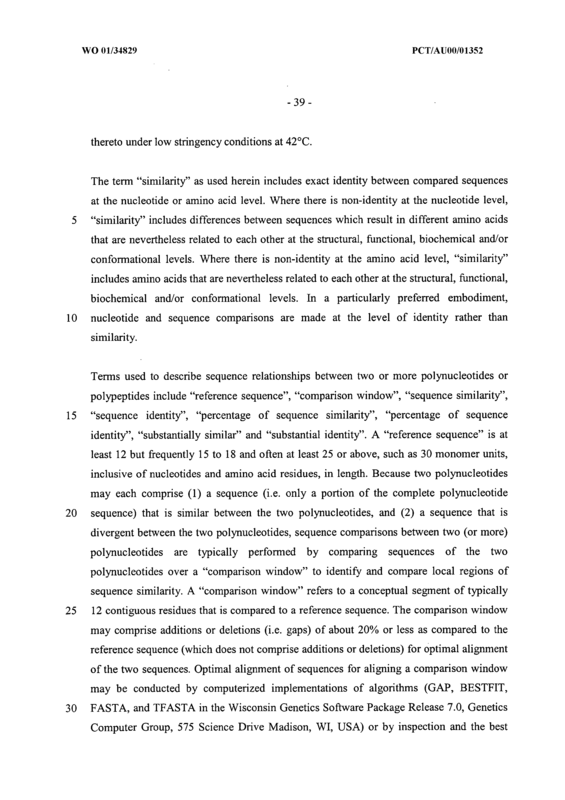 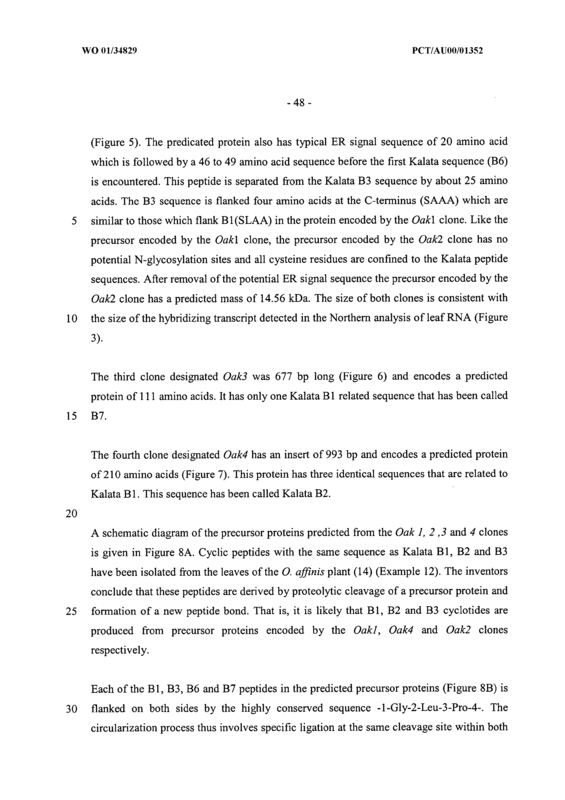 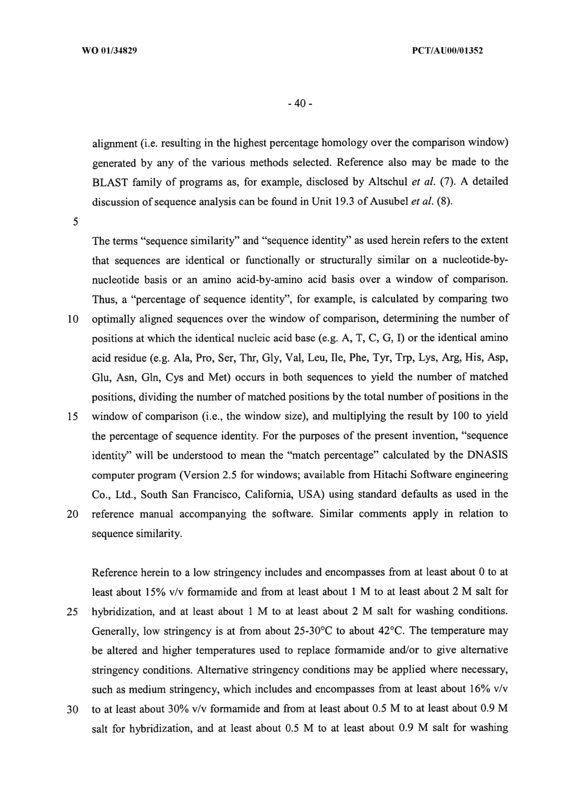 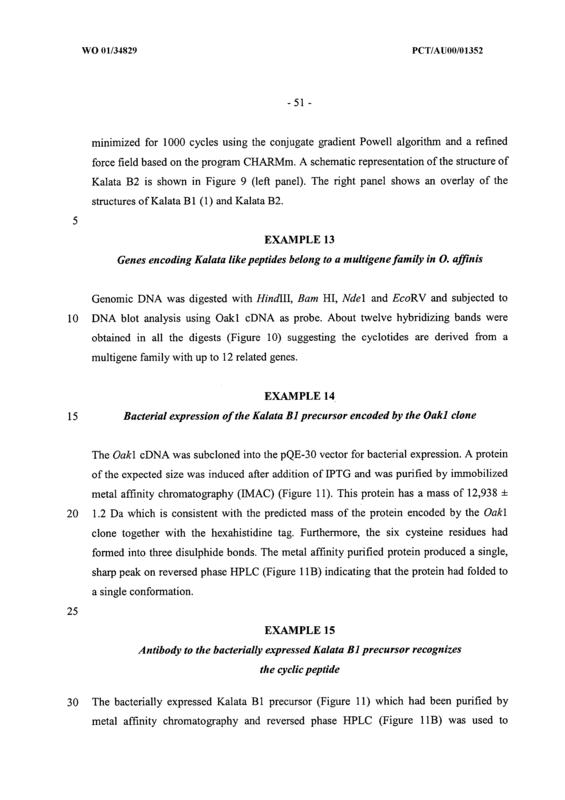 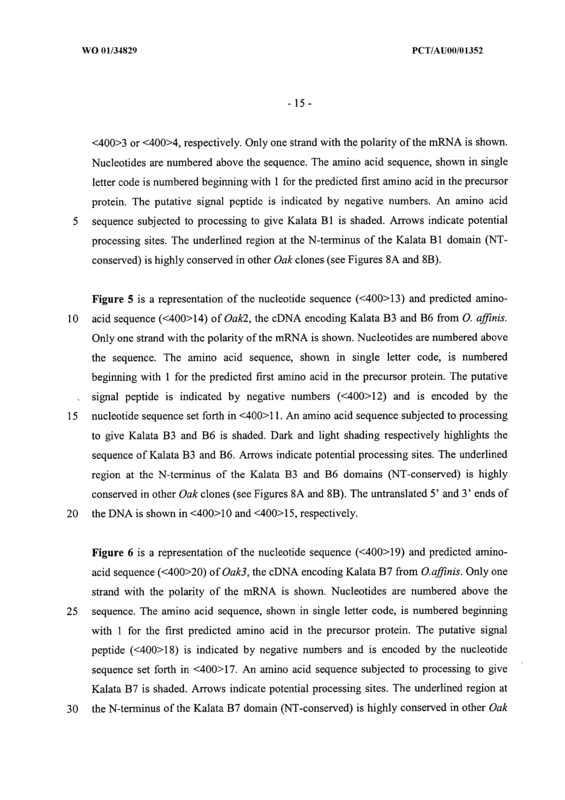 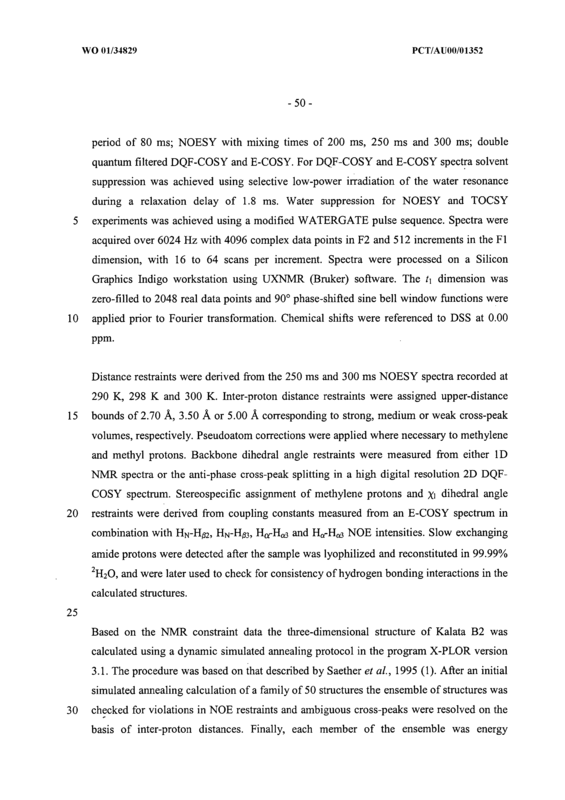 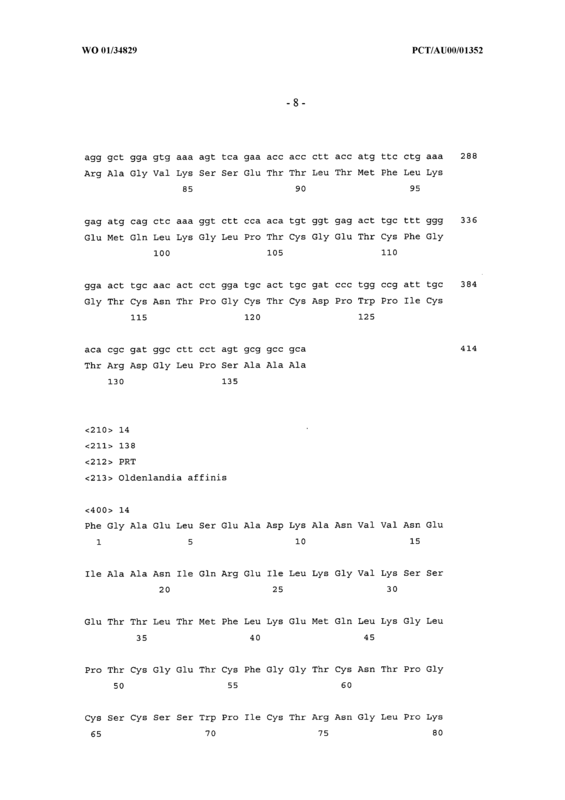 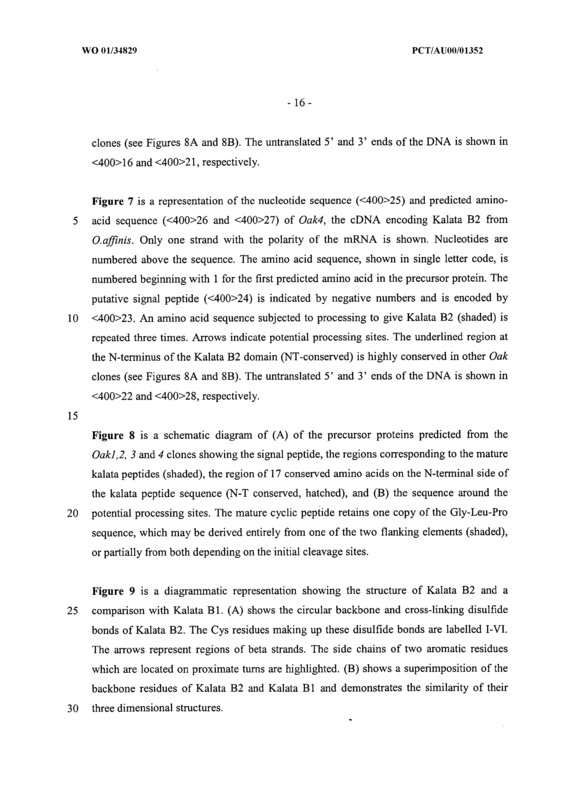 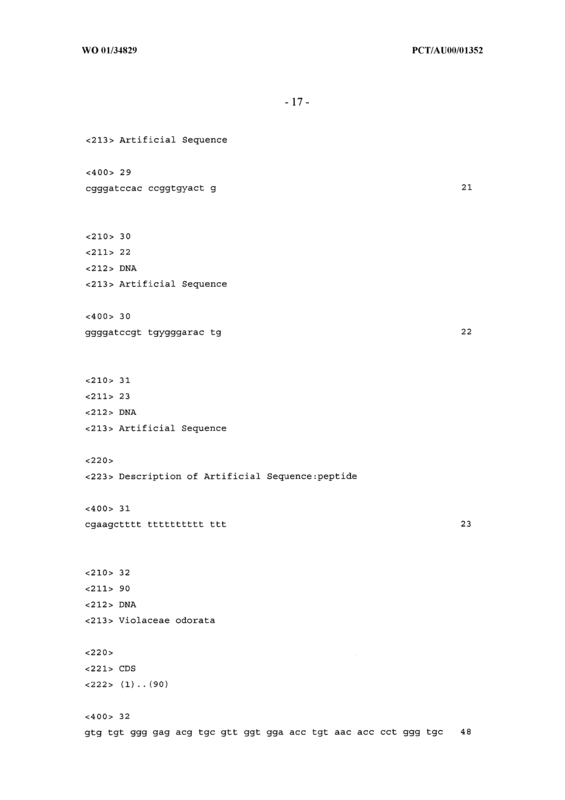 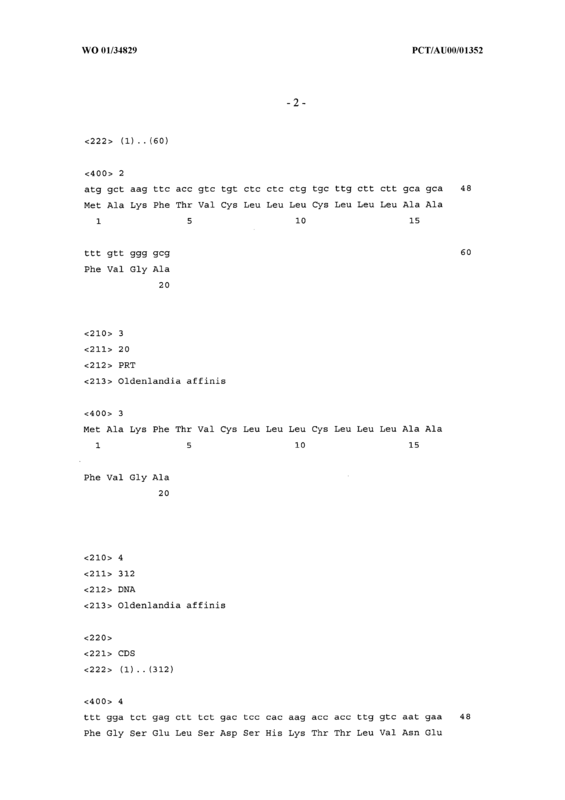 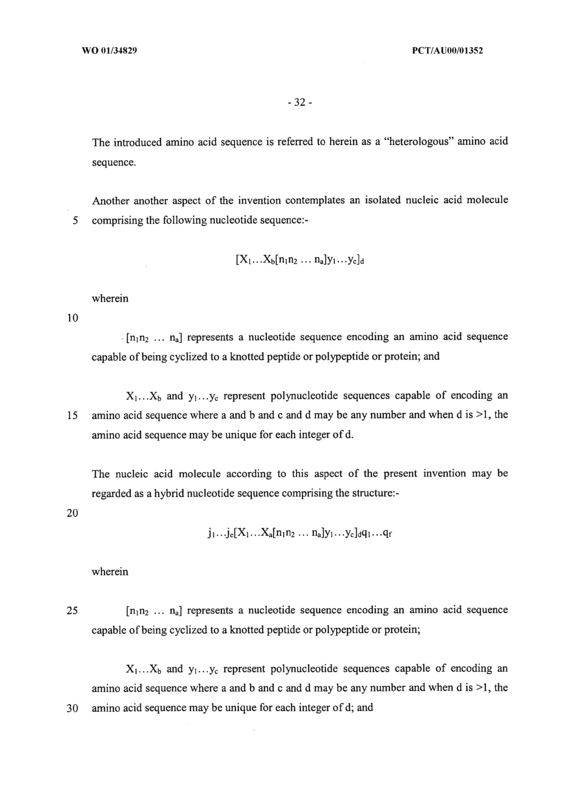 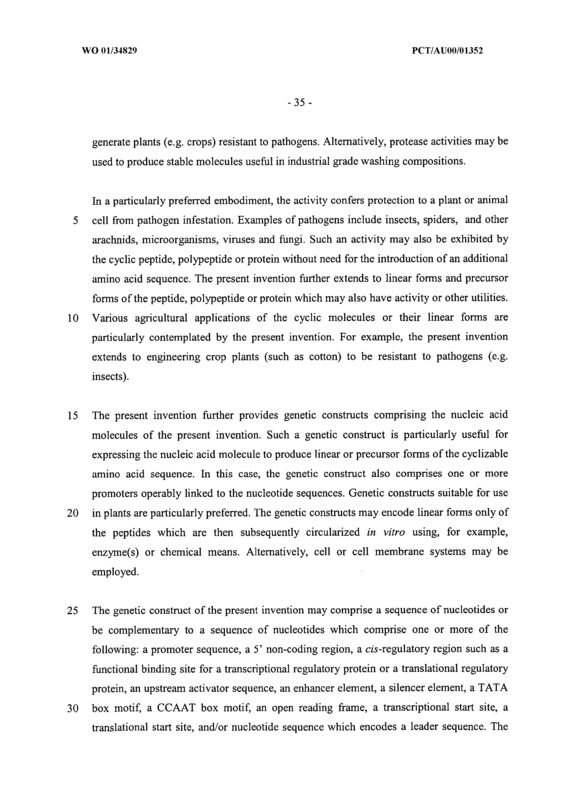 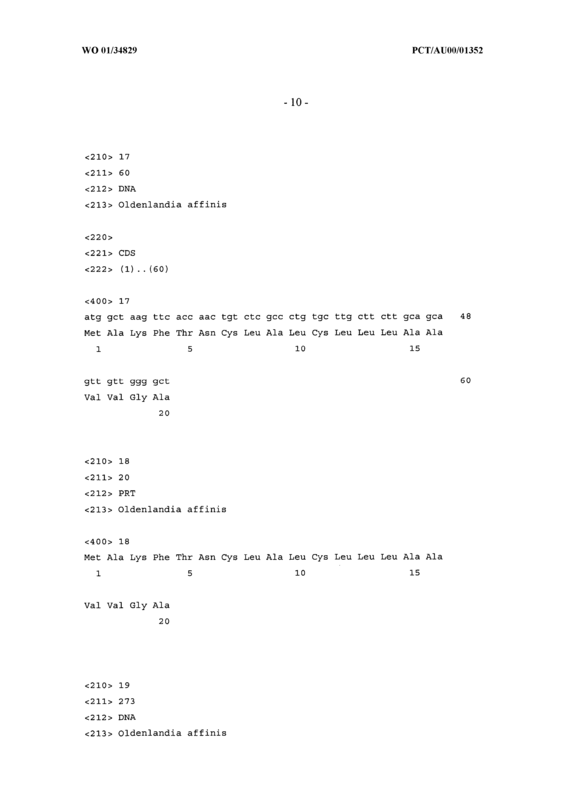 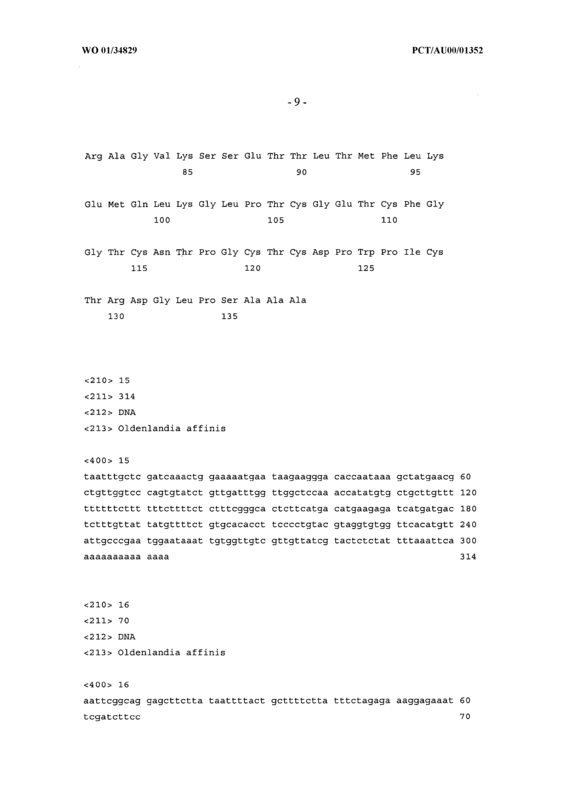 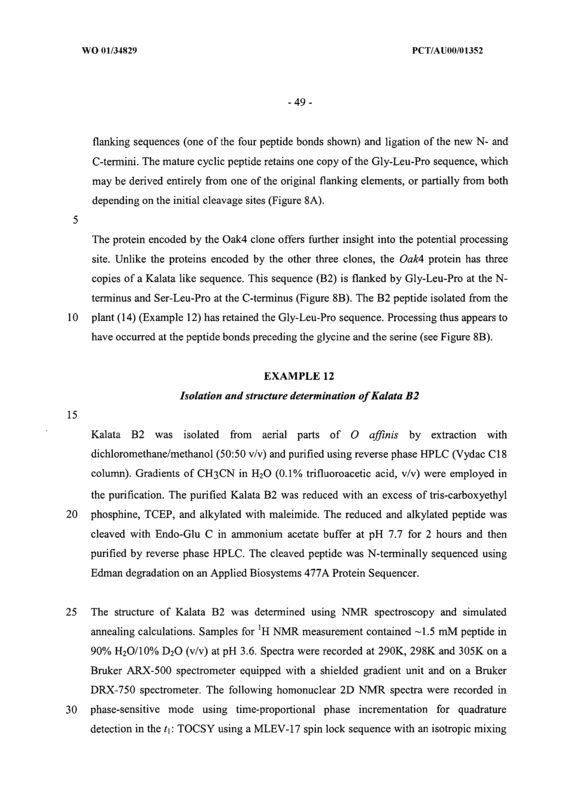 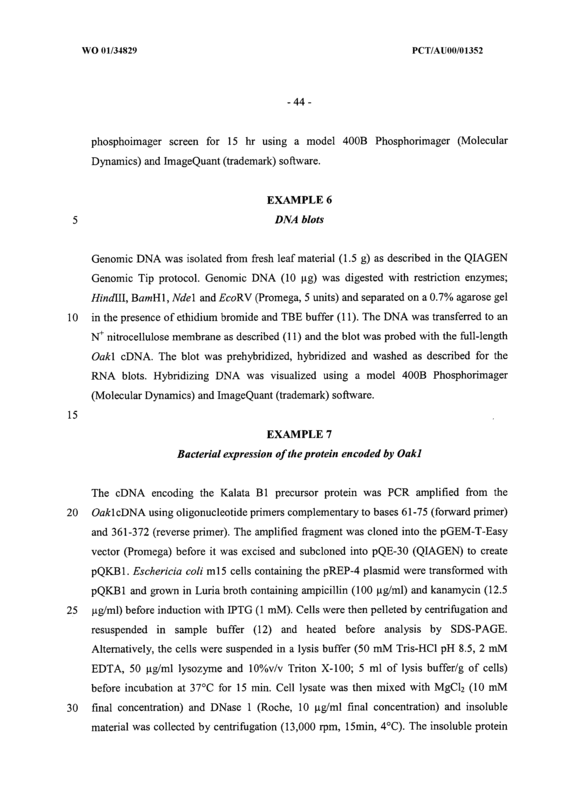 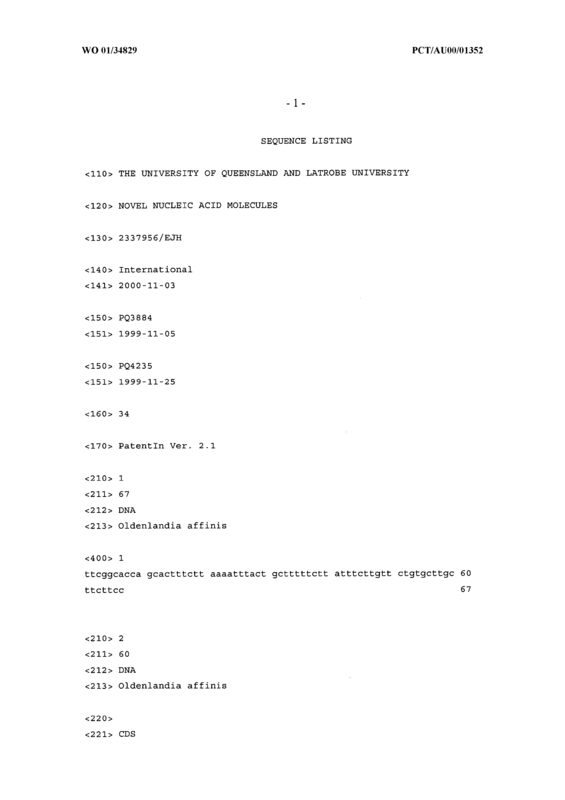 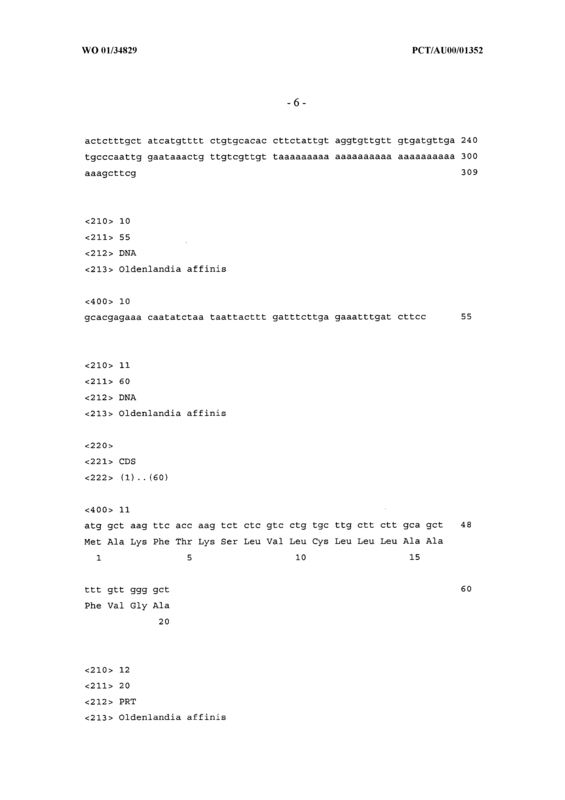 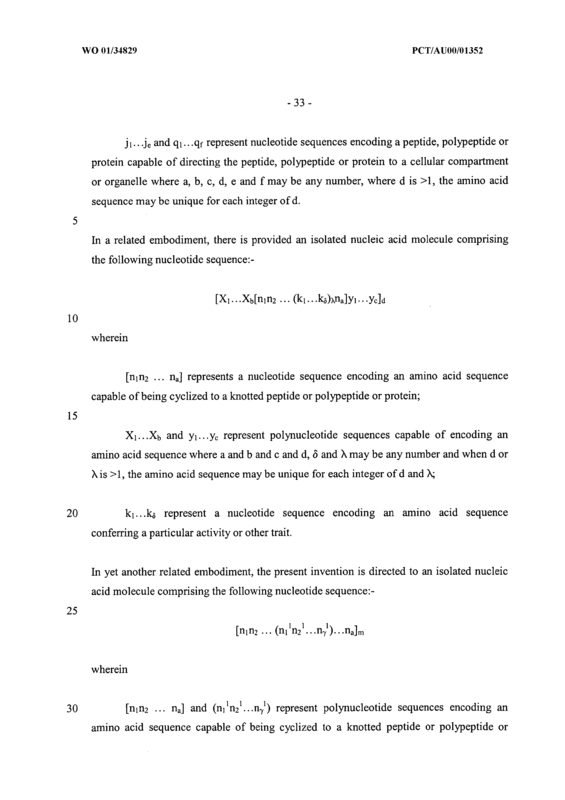 A method according to any one of Claims 20 to 27 wherein the inserted or WO 01/34829 PCT/AUOO/01352 -61 substituted or otherwise grafted amino acid residues are a single residue or a linear sequence of from about 2 residues to about 60 residues. 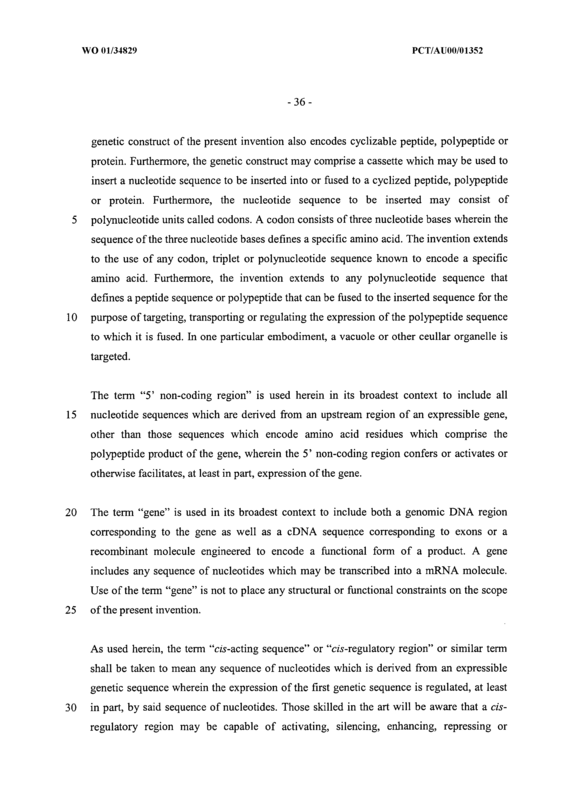 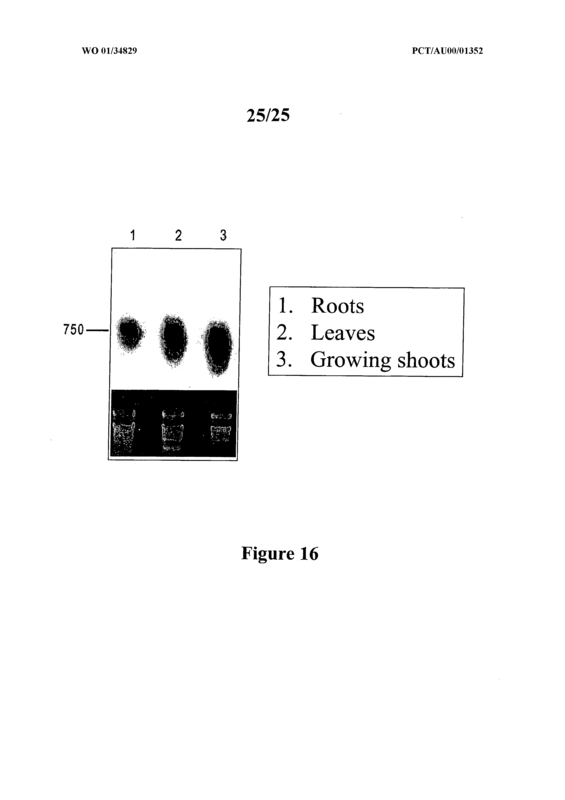 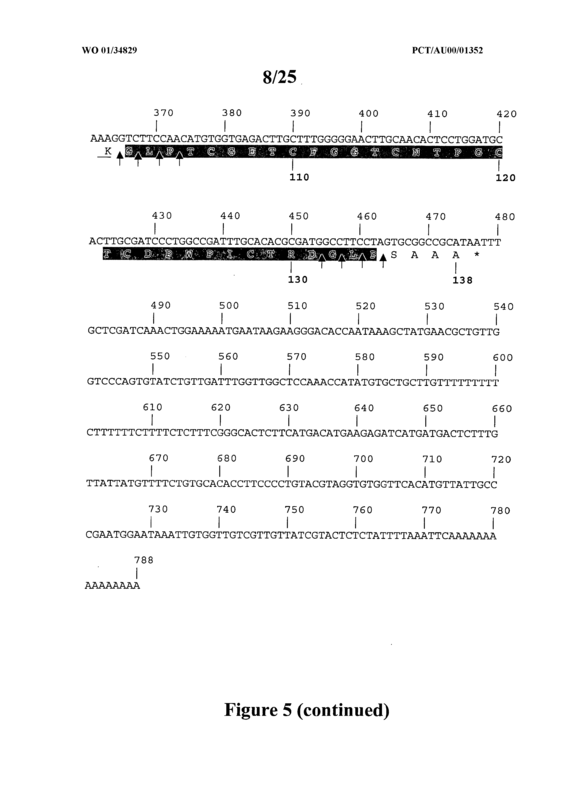 A method according to Claim 28 wherein the inserted or substituted or otherwise grafted amino acid residues are a single residue or a linear sequence of from about 2 residues to about 30 residues. 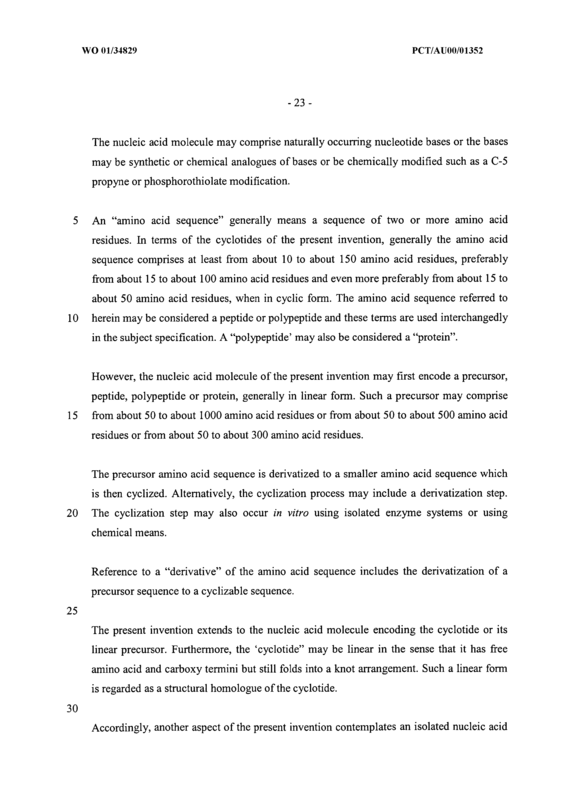 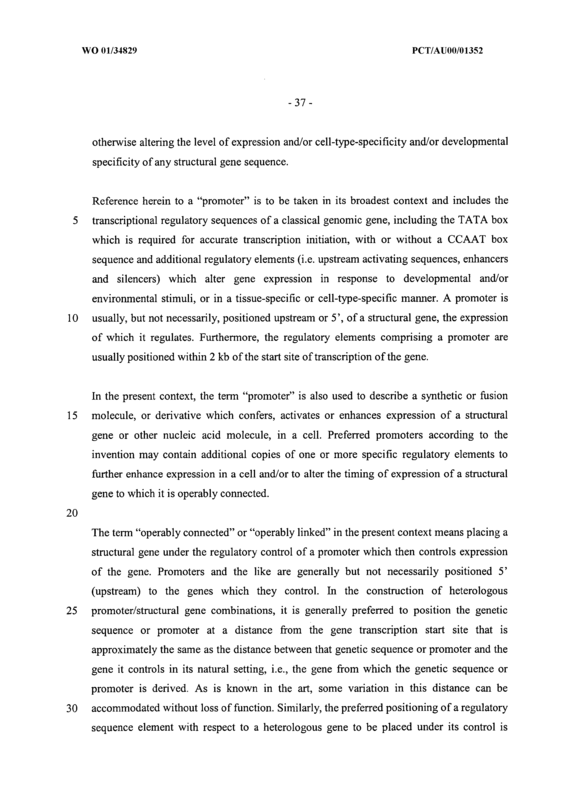 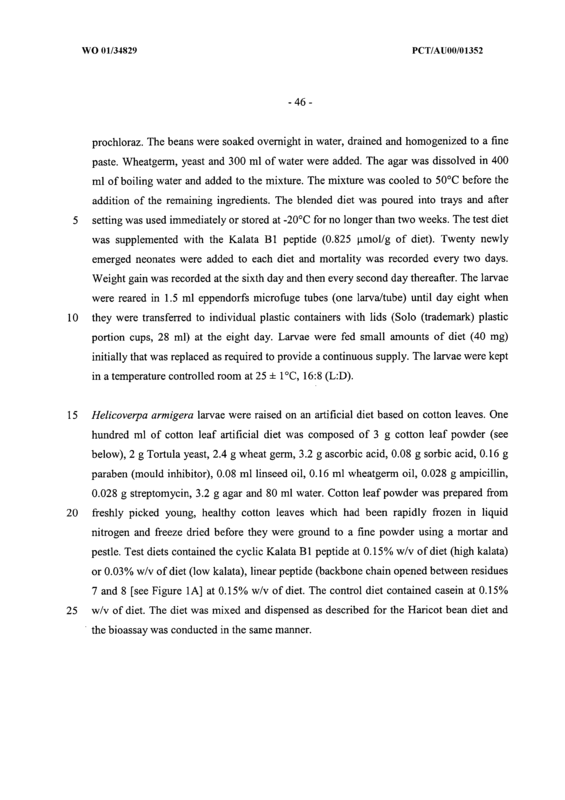 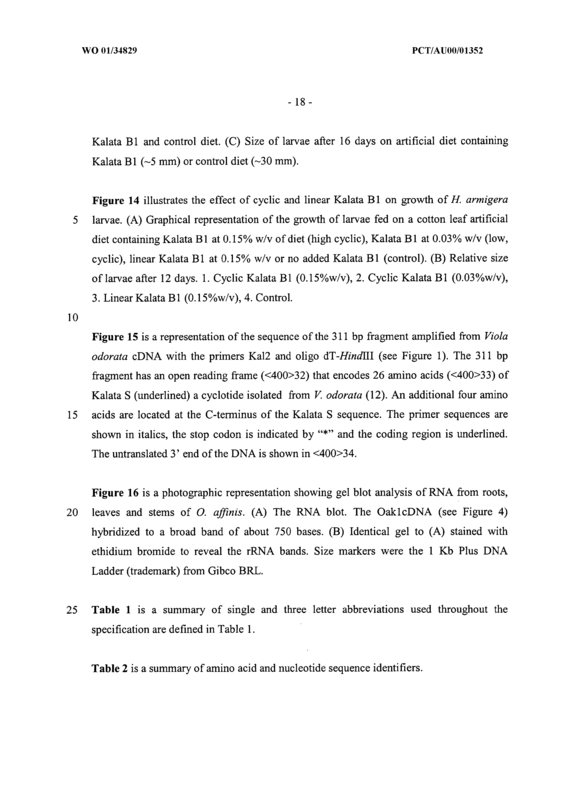 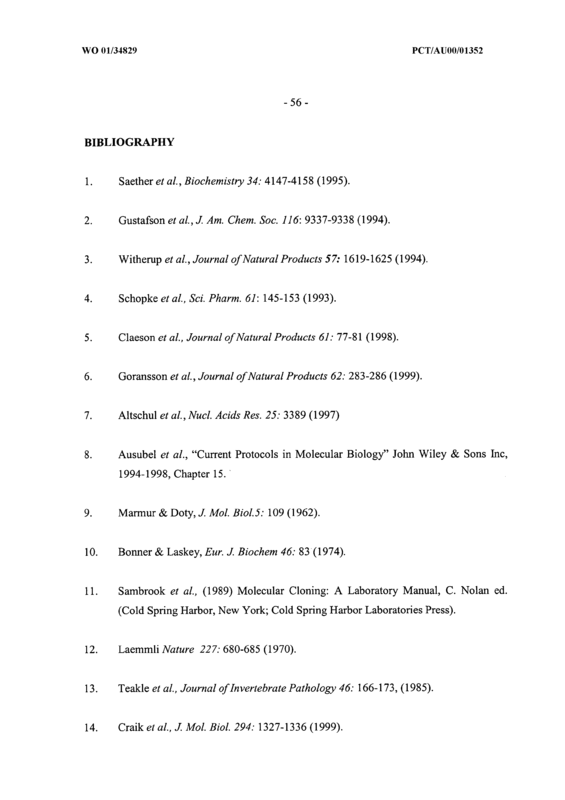 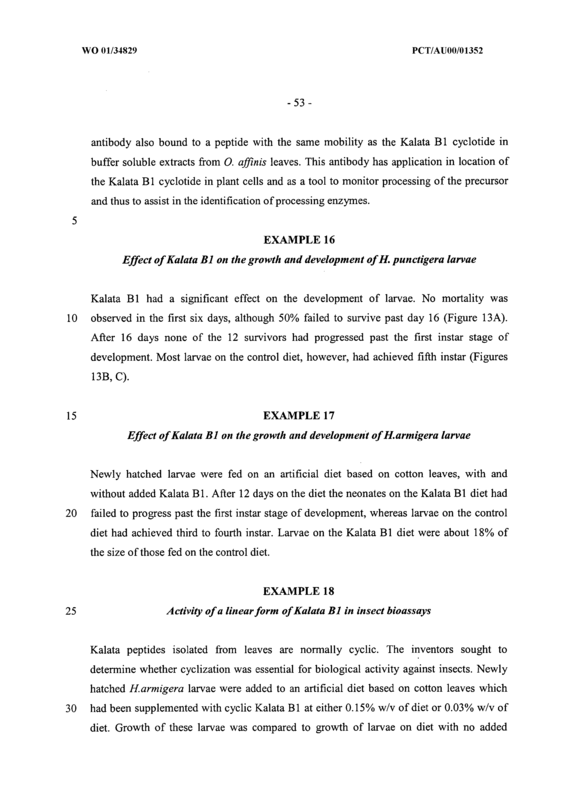 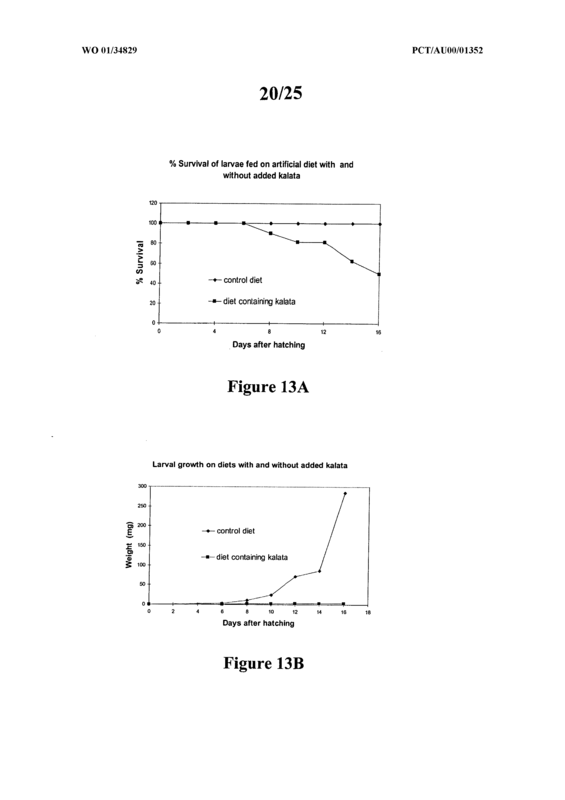 A method according to any one of Claims 20 to 29 wherein the inserted or substituted or otherwise grafted amino acid residues are a single residue or a linear sequence of from about 2 residues to about 10 residues. 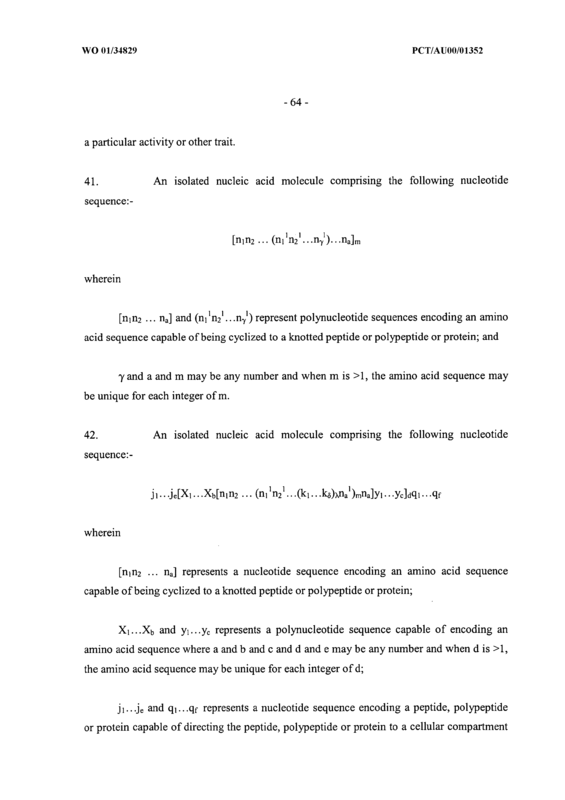 A method according to Claim 20 wherein the amino acid sequence encoded by the second said nucleotide sequence is set forth in <400>5 or <400>14 or an amino acid sequence being at least about 60% similar to any one or more of <400>5 or <400>14. 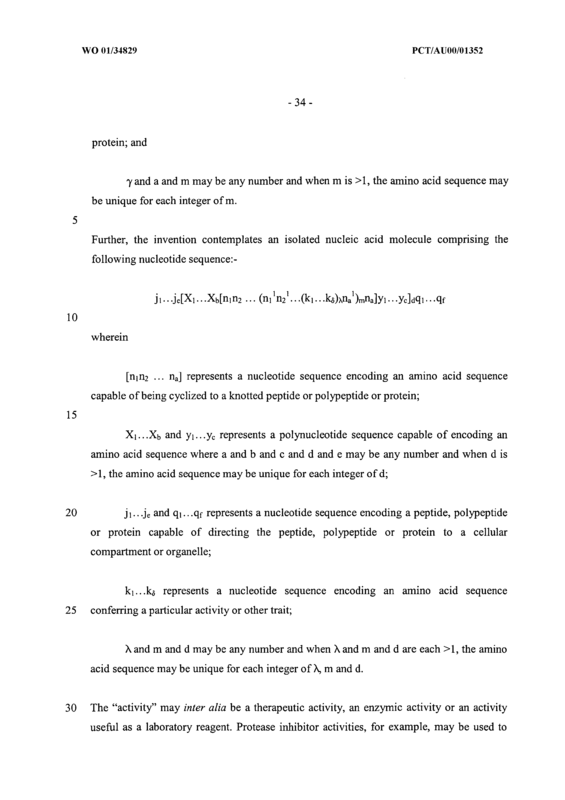 A method according to Claim 20 wherein the amino acid sequence encoded by the second said nucleotide sequence is set forth in <400>20 or an amino acid sequence being at least about 60% similar thereto. 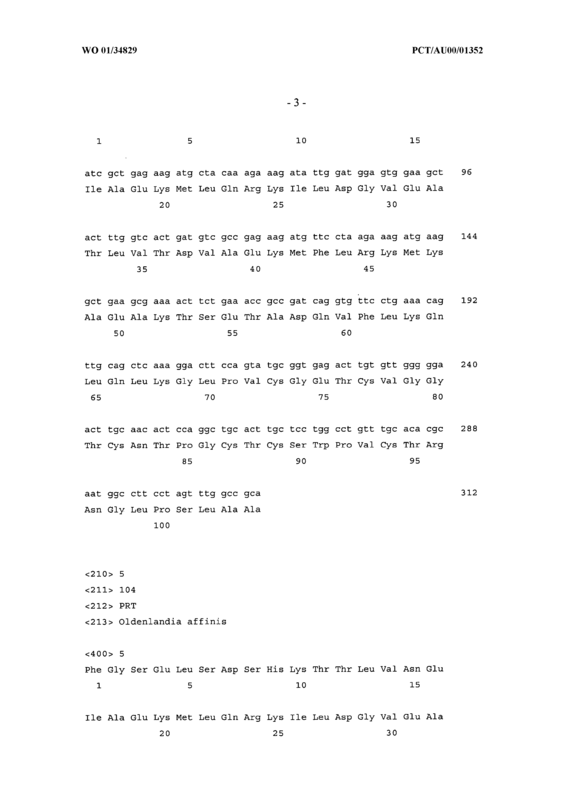 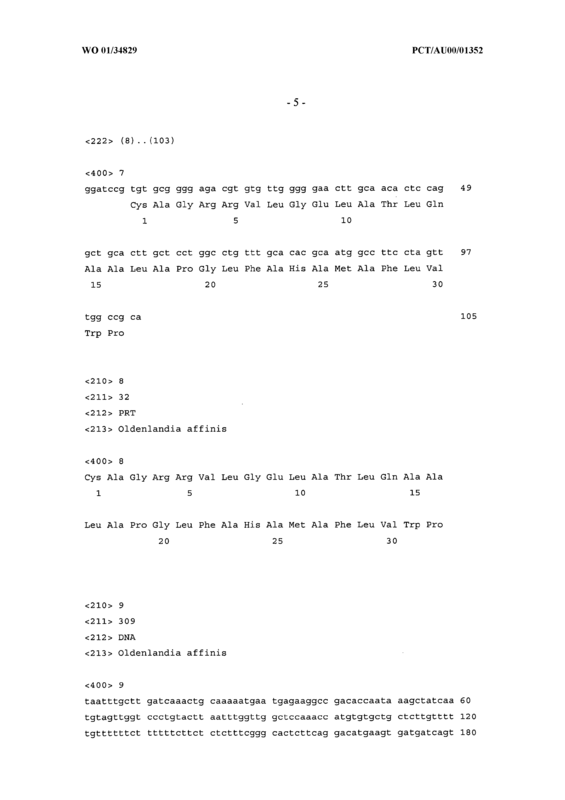 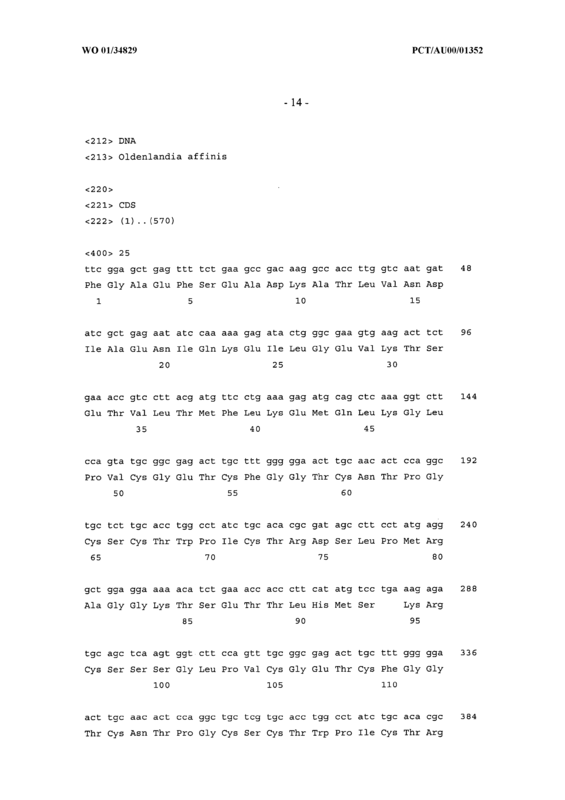 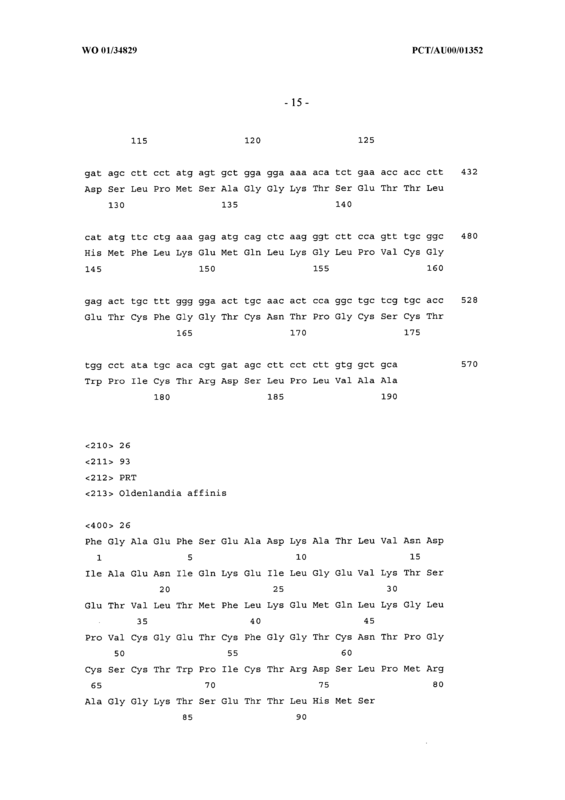 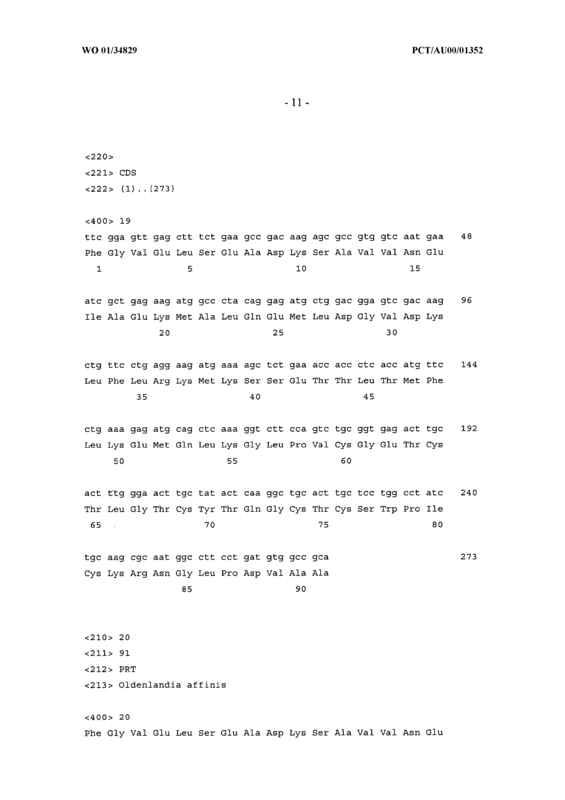 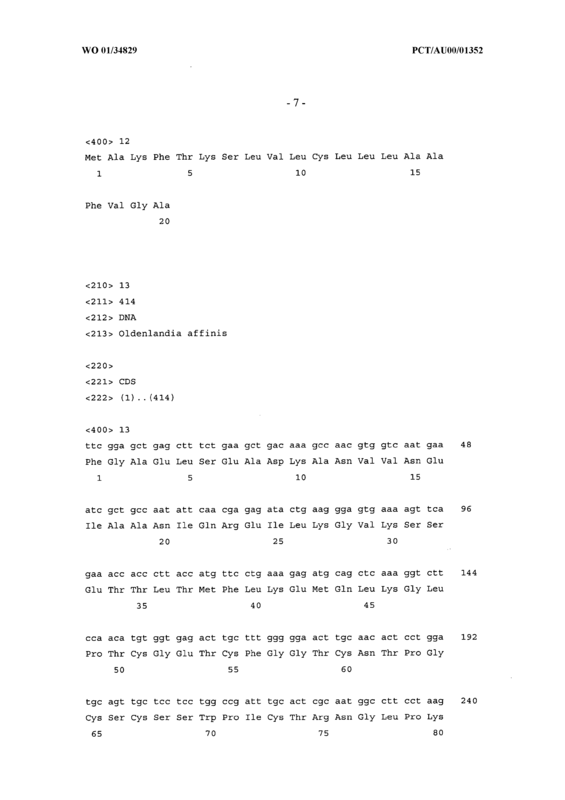 A method according to Claim 20 wherein the amino acid sequence encoded by the second said nucleotide sequence is set forth in <400>26 or an amino acid sequence being at least about 60% similar thereto. 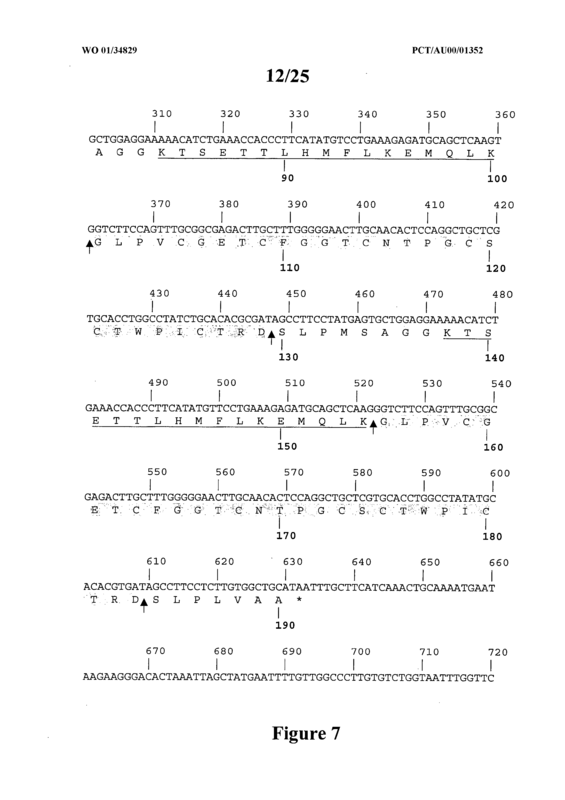 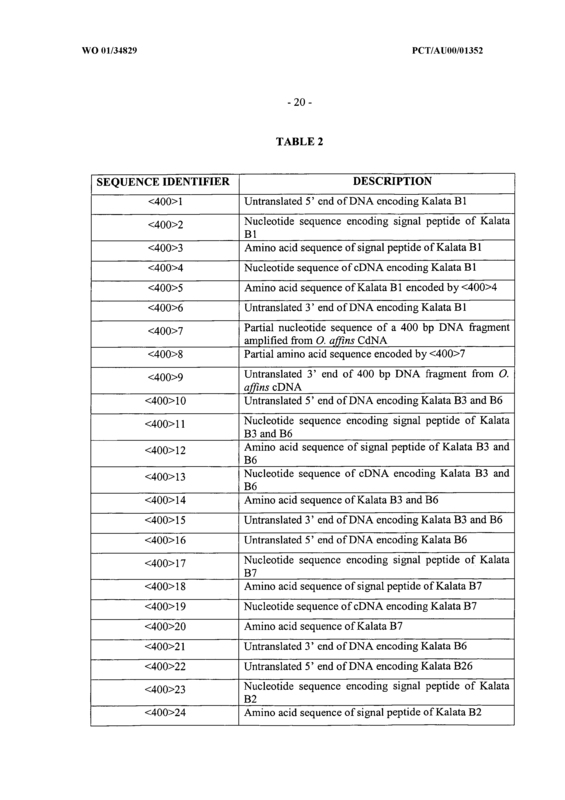 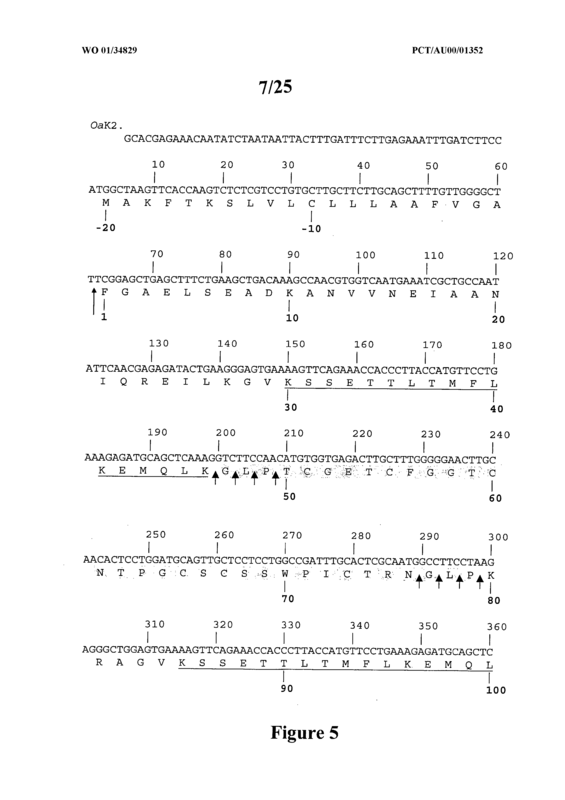 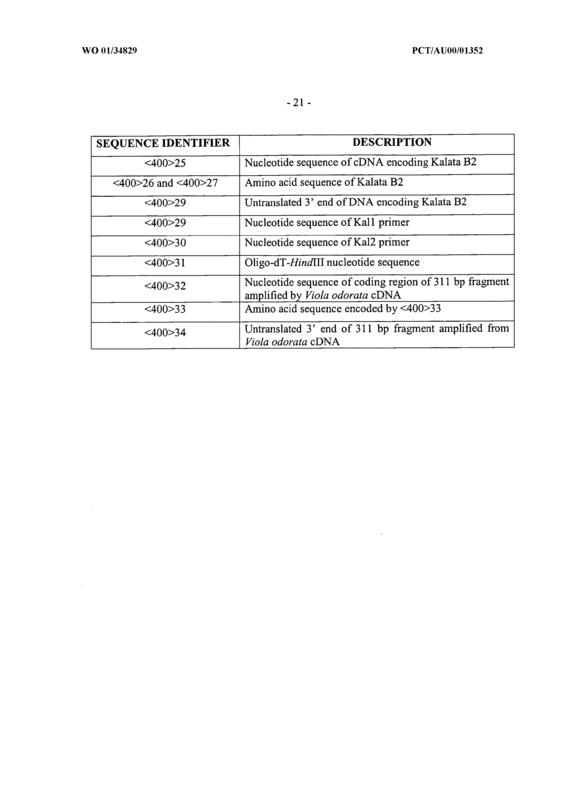 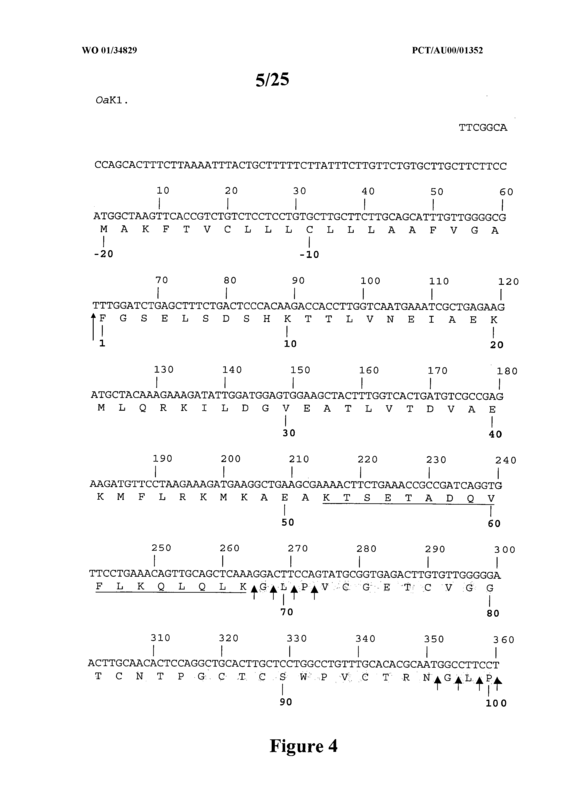 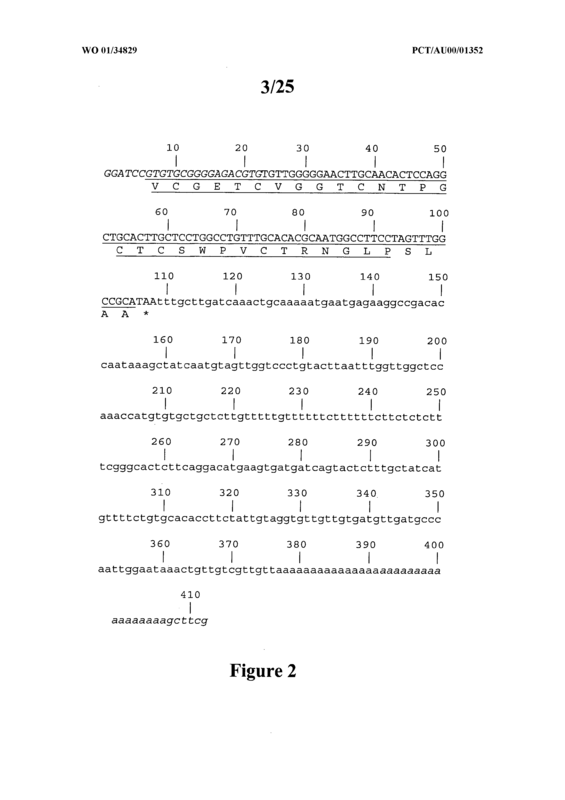 A method according to Claim 20 wherein the second nucleic acid sequence comprises the nucleotide sequence set forth in <400>4 or <400>13 or a nucleotide sequence having at least about 60% similarity to <400>4 or <400>13 or a nucleotide sequence capable of hybridizing to <400>4 or <400>13 or their complements under low stringency conditions at 420 C.
A method according to Claim 20 wherein the second nucleic acid sequence comprises the nucleotide sequence set forth in <400>19 or a nucleotide sequence having at WO 01/34829 PCT/AUOO/01352 - 62 least about 60% similarity to <400>19 or a nucleotide sequence capable of hybridizing to <400>19 or its complement under low stringency conditions at 421C. 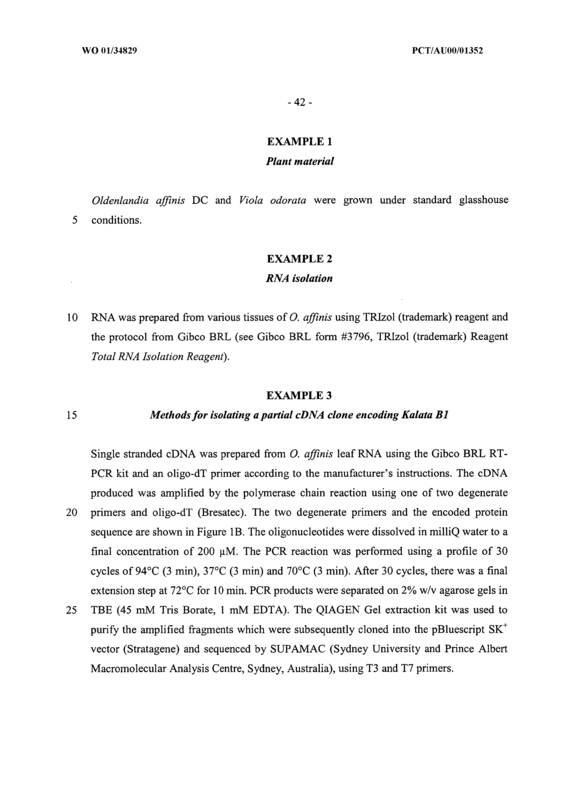 A method according to Claim 20 wherein the second nucleic acid sequence comprises the nucleotide sequence set forth in <400>25 or a nucleotide sequence having at least about 60% similarity to <400>25 or a nucleotide sequence capable of hybridizing to <400>25 or its complement under low stringency conditions at 42*C.
A method according to Claim 20 wherein the nucleotide sequence encodes a molecule with modulates calcium channel-binding ability, C5a binding activity, proteinase inhibitor activity in plants or animals, antibiotic activity, HIV activity, plant pathogen activity, microbial activity, fungal activity, viral activity, cytokine binding ability and blood clot inhibiting ability. 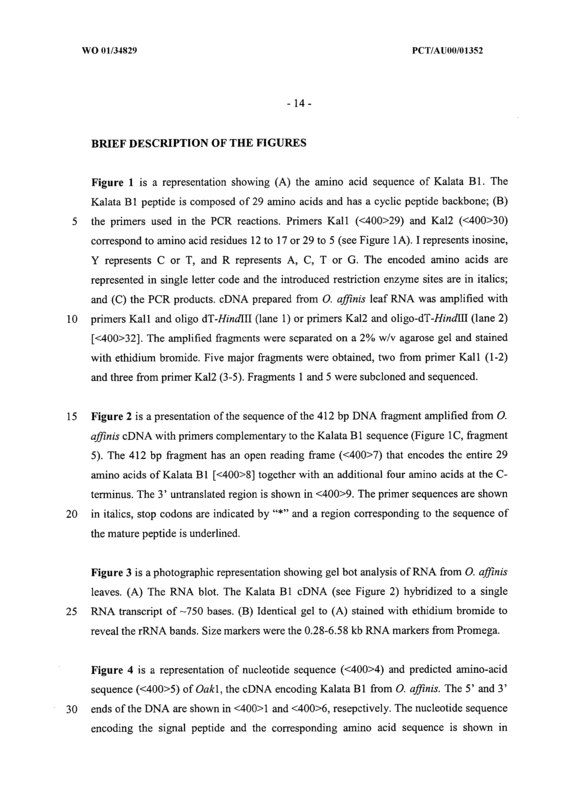 An isolated nucleic acid molecule comprising the following nucleotide sequence: [X1...Xb[nin 2 ... na1...ycd wherein [nn 2 ... na] represents a nucleotide sequence encoding an amino acid sequence capable of being cyclized to a knotted peptide or polypeptide or protein; and X 1 .. .Xb and yi... ye represent polynucleotide sequences capable of encoding an amino acid sequence where a and b and c and d may be any number and when d is >1, the amino acid sequence may be unique for each integer of d.
An isolated nucleic acid molecule comprising the following nucleotide sequence:- WO 01/34829 PCT/AUOO/01352 - 63 ji ... je[X1 ... Xa[nin2 ... najy1... ycldqi... qf wherein [nn 2 ... na] represents a nucleotide sequence encoding an amino acid sequence capable of being cyclized to a knotted peptide or polypeptide or protein; X1... Xb and y... ye represent polynucleotide sequences capable of encoding an amino acid sequence where a and b and c and d may be any number and when d is >1, the amino acid sequence may be unique for each integer of d; and jii...je and qi... qf represent nucleotide sequences encoding a peptide, polypeptide or protein capable of directing the peptide, polypeptide or protein to a cellular compartment or organelle where a, b, c, d, e and f may be any number, where d is >1, the amino acid sequence may be unique for each integer of d.
An isolated nucleic acid molecule comprising the following nucleotide sequence: [XI...Xb[nin2 ... (ki...k)xna]y1... yc]d wherein [nin2 ... na] represents a nucleotide sequence encoding an amino acid sequence capable of being cyclized to a knotted peptide or polypeptide or protein; Xi.. .Xb and y1 ... yc represent polynucleotide sequences capable of encoding an amino acid sequence where a and b and c and d, 8 and X may be any number and when d or X is >1, the amino acid sequence may be unique for each integer of d and X; k1.. k represent a nucleotide sequence encoding an amino acid sequence conferring WO 01/34829 PCT/AUOO/01352 - 64 a particular activity or other trait. 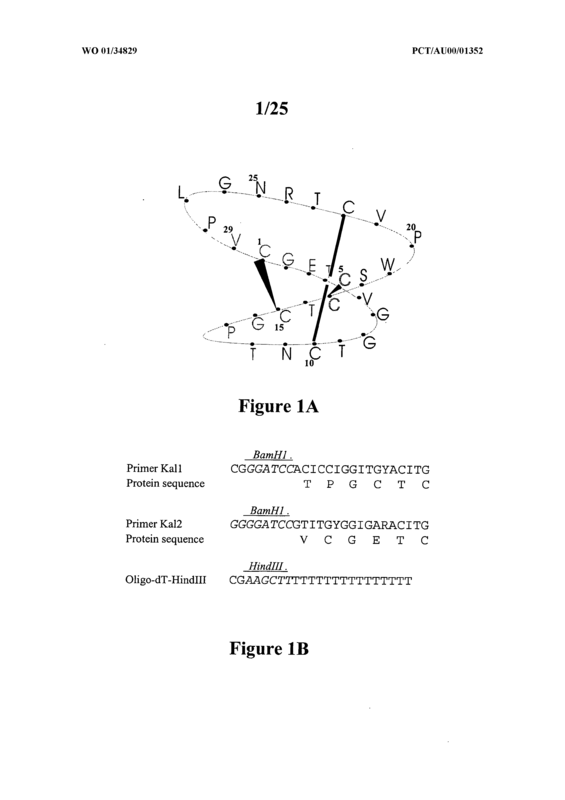 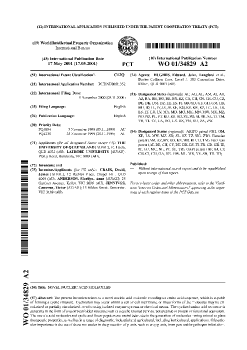 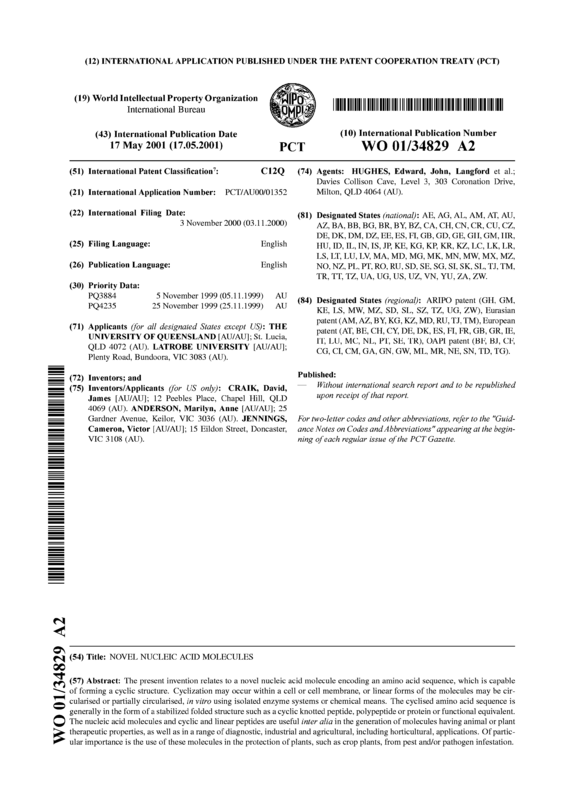 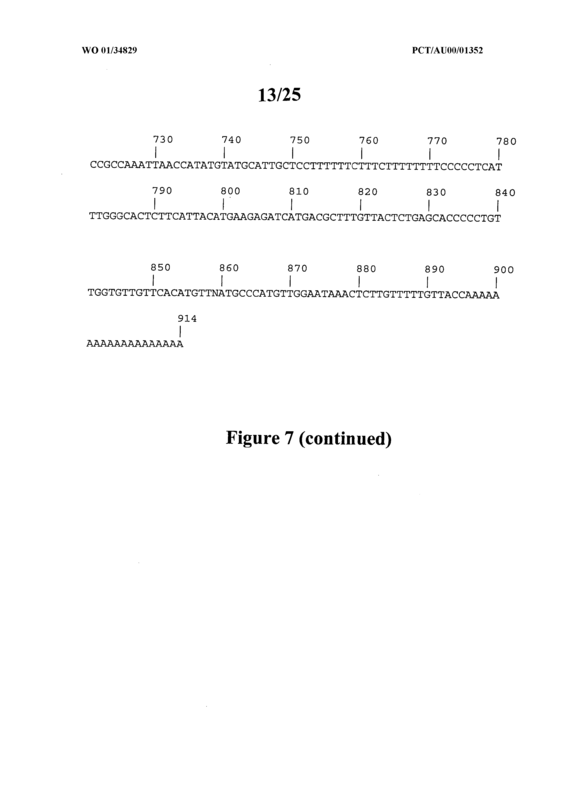 An isolated nucleic acid molecule comprising the following nucleotide sequence: [nin2 ... (n I n2 ... n-y) ... na]m wherein [nin 2 ... na] and (nI n2 I.. .nQy) represent polynucleotide sequences encoding an amino acid sequence capable of being cyclized to a knotted peptide or polypeptide or protein; and y and a and m may be any number and when m is >1, the amino acid sequence may be unique for each integer of m.
An isolated nucleic acid molecule comprising the following nucleotide sequence: ji ...je[X1 ... Xb[nin2 ... (nii1n21 ... (ki ... lkg)xna')mna]yi ... yclaqi... qf wherein [nin 2 ... na] represents a nucleotide sequence encoding an amino acid sequence capable of being cyclized to a knotted peptide or polypeptide or protein; X1 ... Xb and y1 ... yc represents a polynucleotide sequence capable of encoding an amino acid sequence where a and b and c and d and e may be any number and when d is >1, the amino acid sequence may be unique for each integer of d; ji .. .je and qi... qf represents a nucleotide sequence encoding a peptide, polypeptide or protein capable of directing the peptide, polypeptide or protein to a cellular compartment WO 01/34829 PCT/AUOO/01352 - 65 or organelle; kl...k6 represents a nucleotide sequence encoding an amino acid sequence conferring a particular activity or other trait; X and m and d may be any number and when X and m and d are each >1, the amino acid sequence may be unique for each integer of X, m and d.
An isolated nucleic acid molecule according to Claim 38 or 39 or 40 or 41 or 42 comprising the nucleotide sequence set forth in <400>4 or <400>13 or a nucleotide sequence having at least about 60% similarity to <400>4 or <400>13 or a nucleotide sequence capable of hybridizing to <400>4 or <400>13 or their complements under low stringency conditions at 42'C. 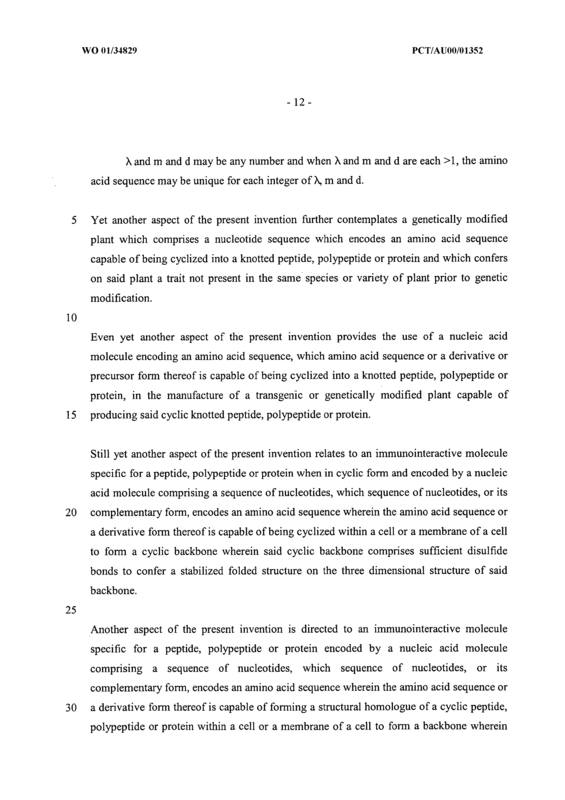 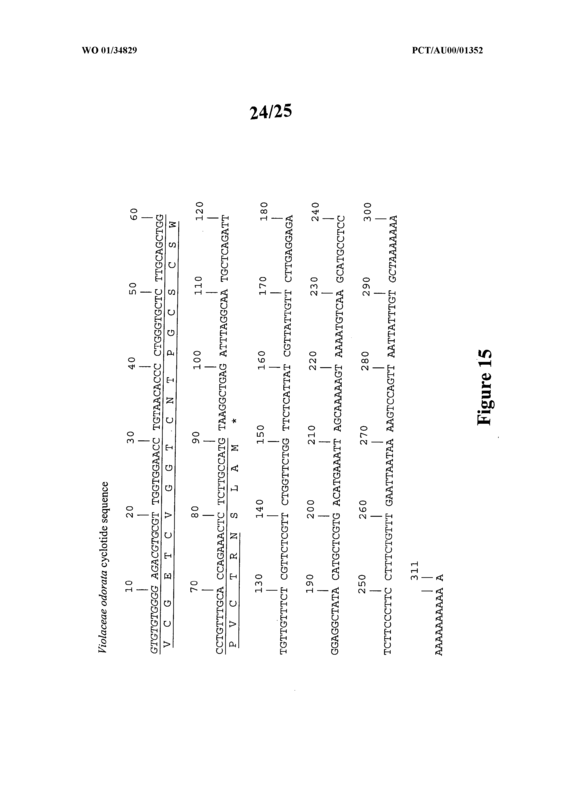 An isolated nucleic acid molecule according to Claim 38 or 39 or 40 or 41 or 42 comprising the nucleotide sequence set forth in <400>19 or a nucleotide sequence having at least about 60% similarity to <400>19 or a nucleotide sequence capable of hybridizing to <400>19 or its complement under low stringency conditions at 42'C. 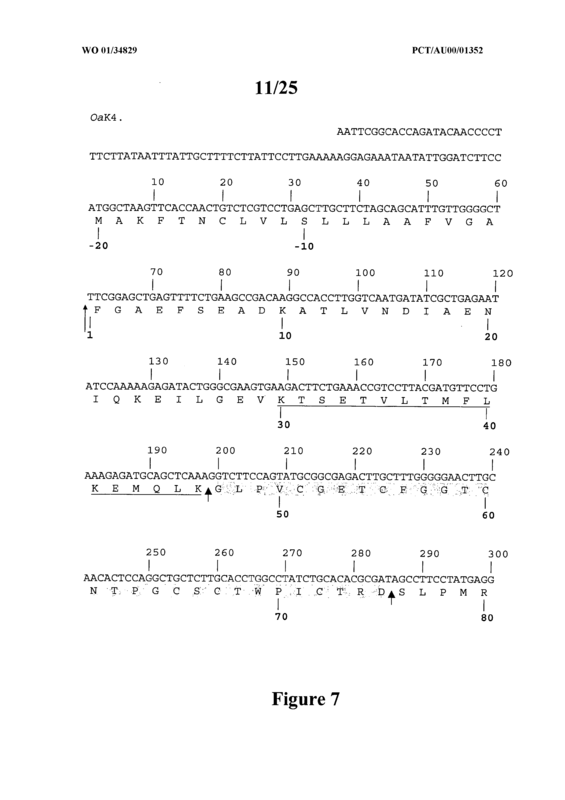 An isolated nucleic acid molecule according to Claim 38 or 39 or 40 or 41 or 42 comprising the nucleotide sequence set forth in <400>25 or a nucleotide sequence having at least about 60% similarity to <400>25 or a nucleotide sequence capable of hybridizing to <400>25 or its complement under low stringency conditions at 42'C. 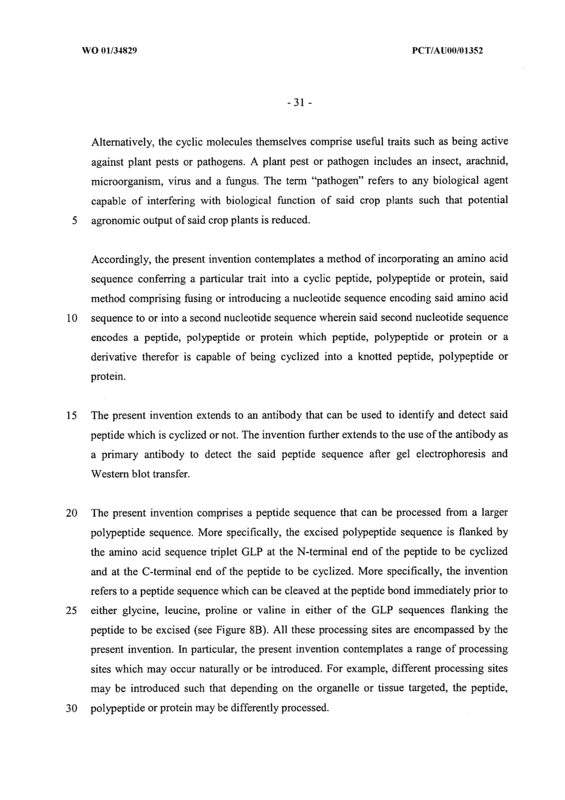 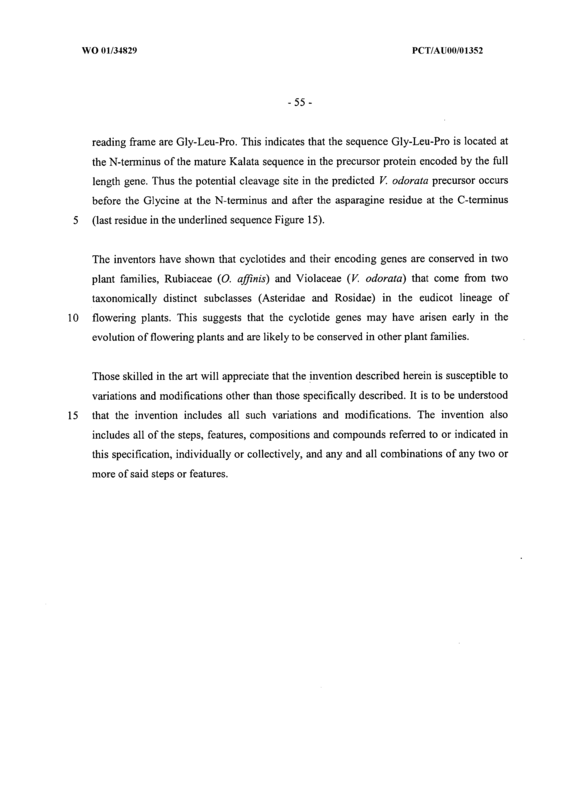 A genetically modified plant which comprises a nucleotide sequence which encodes an amino acid sequence capable of being cyclized into a knotted peptide, polypeptide or protein and which confers on said plant a trait not present in the same species or variety of plant prior to genetic modification. 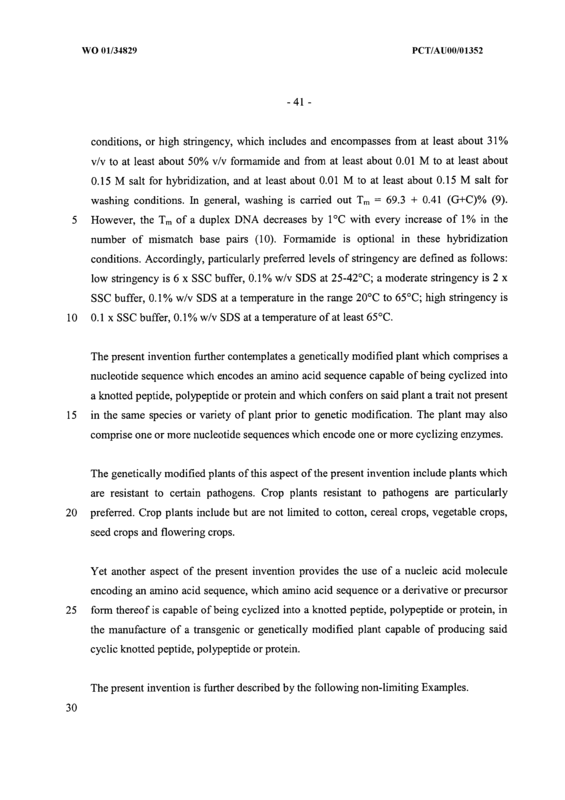 A genetically modified plant according to Claim 47 wherein the plant is cotton. 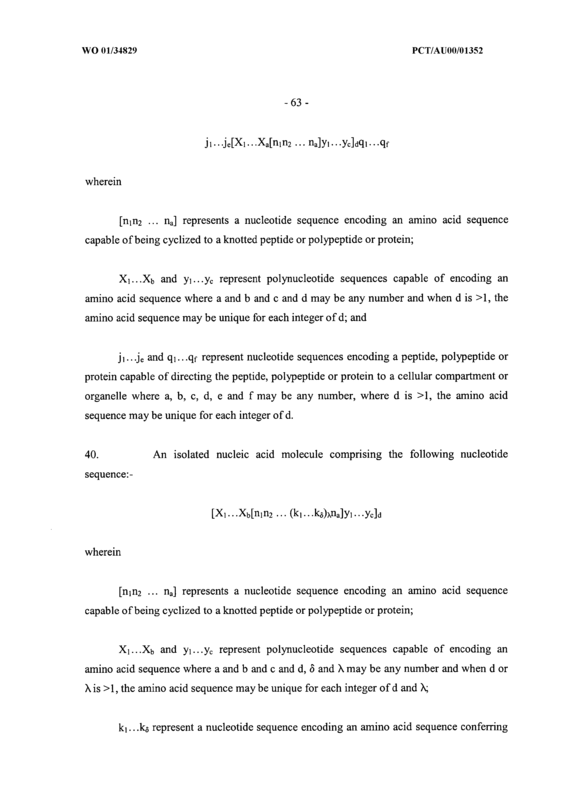 An immunointeractive molecule specific for a peptide, polypeptide or protein when in cyclic form and encoded by a nucleic acid molecule comprising a sequence of nucleotides, which sequence of nucleotides, or its complementary form, encodes an amino acid sequence wherein the amino acid sequence or a derivative form thereof is capable of being cyclized within a cell or a membrane of a cell to form a cyclic backbone wherein said cyclic backbone comprises sufficient disulfide bonds to confer a stabilized folded structure on the three dimensional structure of said backbone. 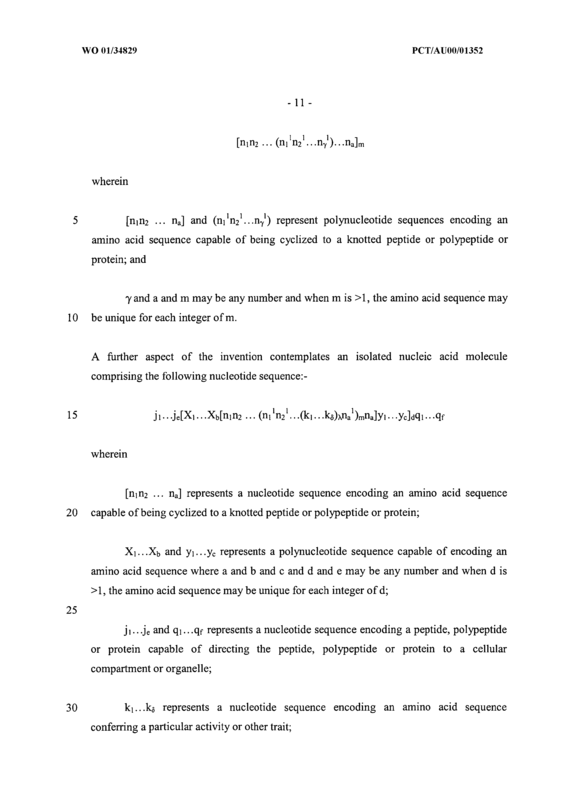 An immunointeractive molecule specific for a peptide, polypeptide or protein encoded by a nucleic acid molecule comprising a sequence of nucleotides, which sequence of nucleotides, or its complementary form, encodes an amino acid sequence wherein the amino acid sequence or a derivative form thereof is capable of forming a structural homologue of a cyclic peptide, polypeptide or protein within a cell or a membrane of a cell to form a backbone wherein said cyclic backbone comprises sufficient disulfide bonds to confer a stabilized folded structure on the three dimensional structure of said backbone wherein said backbone comprises free amino and carboxy termini. 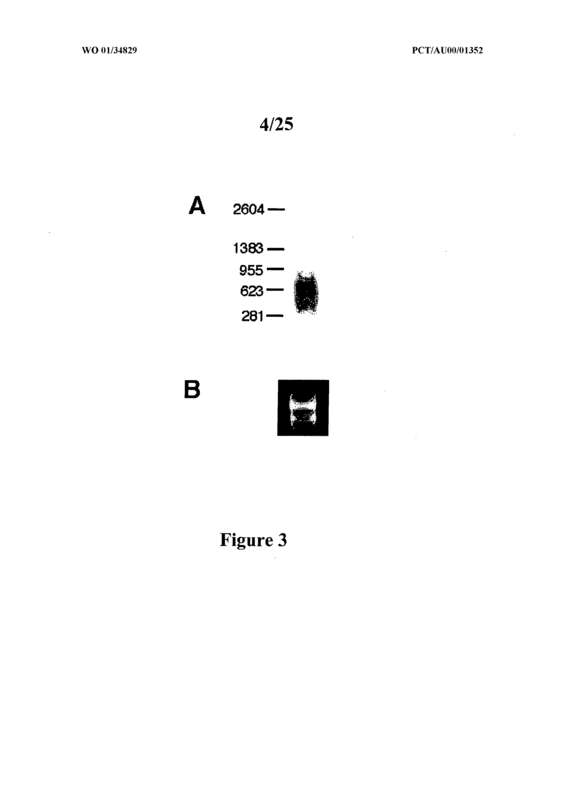 An immunointeractive molecule according to Claim 49 or 50 wherein the immunoreactive molecule is a monoclonal antibody. 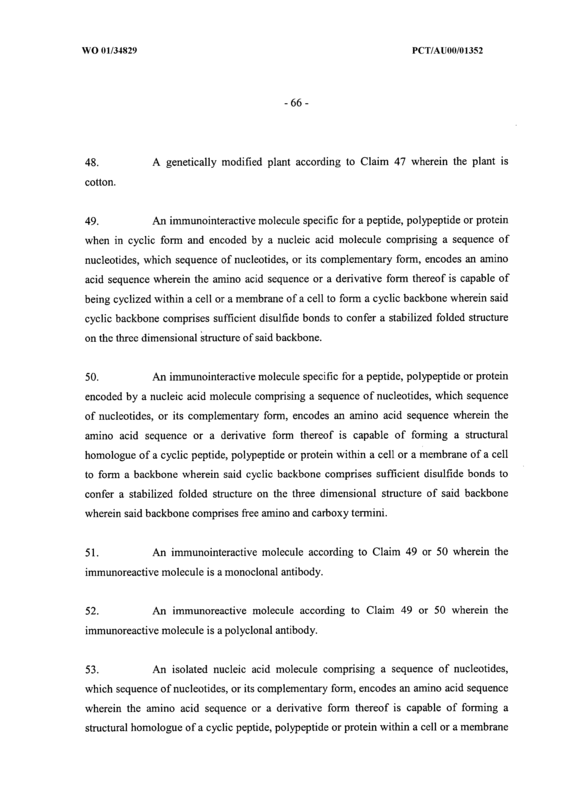 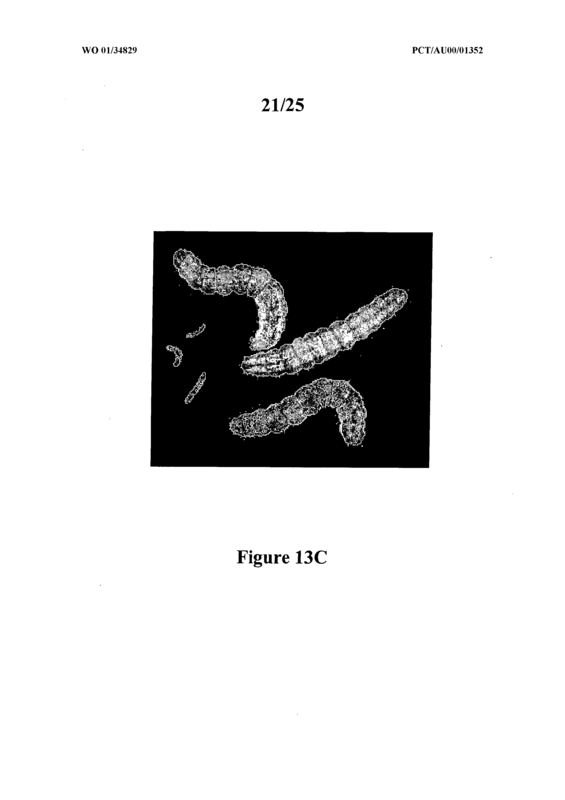 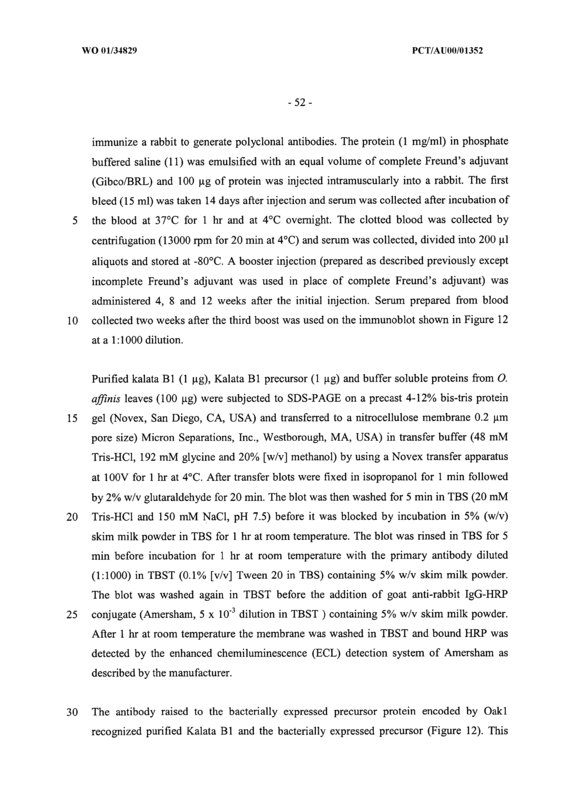 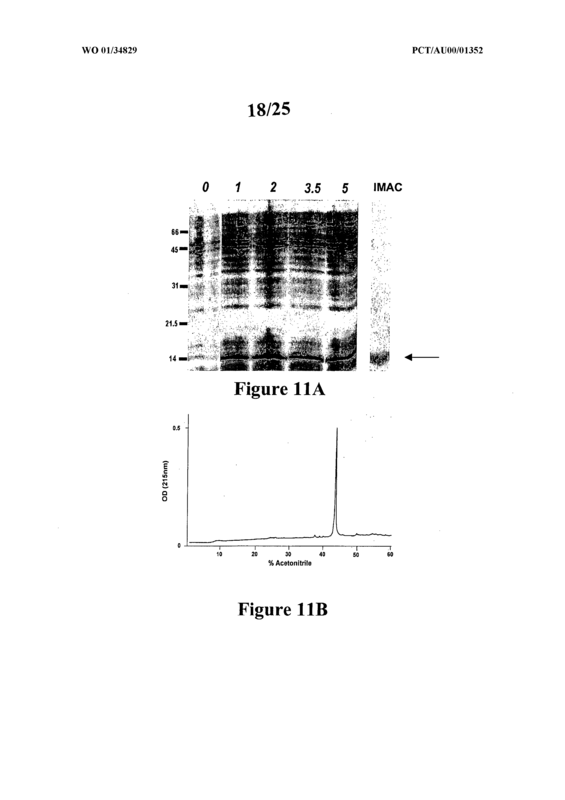 An immunoreactive molecule according to Claim 49 or 50 wherein the immunoreactive molecule is a polyclonal antibody. 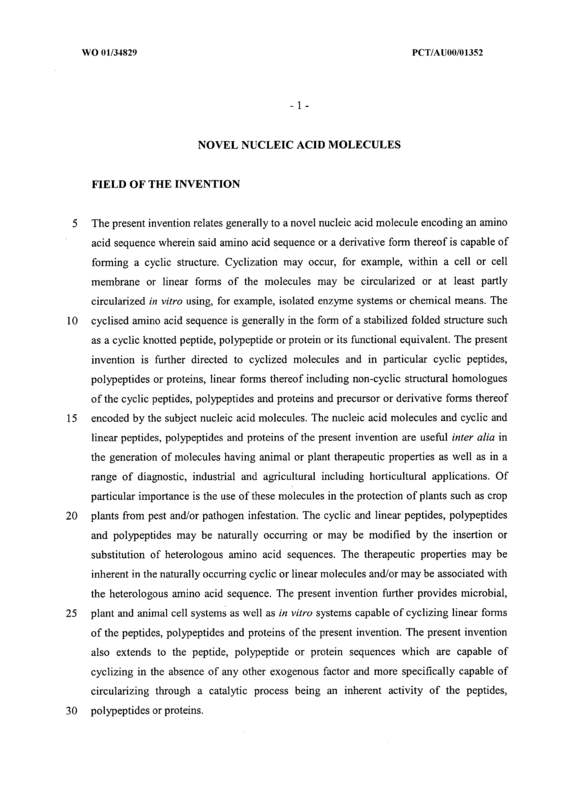 An isolated nucleic acid molecule comprising a sequence of nucleotides, which sequence of nucleotides, or its complementary form, encodes an amino acid sequence wherein the amino acid sequence or a derivative form thereof is capable of forming a structural homologue of a cyclic peptide, polypeptide or protein within a cell or a membrane WO 01/34829 PCT/AUOO/01352 - 67 of a cell to form a backbone wherein said backbone comprises sufficient disulfide bonds to confer a stabilized folded structure on the three-dimensional structure of said backbone wherein said backbone comprises free amino and carboxy termini.